Why Are so Many Americans in Denial of Human’s Contribution to Climate Change, and the Harm its Doing to the Planet? • The correlation between the burning of fossil fuel since the start of the Industrial Revolution and the increase in Carbon Dioxide in the atmosphere couldn’t be more striking. • The melting of the ice cap in the northern hemisphere. • The dramatic warming, with record hot summers (and warmer winters), in northern Europe in recent decades. I’ve been following the Q&A’s on the forums, and I’m amazed at how persistently some people foster their denial of the facts by clinging to flimsy evidence on dubious websites, without properly checking out the facts from reputable sources. One such claim on the Q&A’s being evidence to a link to a dubious website claiming that ‘Global Warming’ is a hoax because the NASA website has photographic proof that the ice sheets in the article circle is actually expanding. However, not only is the author of the website obscure, but on visiting the ‘Genuine’ NASA website their photographic evidence actually shows the ice sheets receding and supports climate change. I wouldn’t mind so much if it was just an academic debate, but America’s blindness to climate change, it’s complacency on the subject, and its reluctance to make a positive effort to stem the change and lessen the damage (by being committed to phasing out fossil fuels in favour of ‘Renewable Energy’) is dragging Europe, and the rest of the world (and America) down a path towards potential disaster; from which there may be no easy return. Nice to hear from you again, it is a mix of greed and willful ignorance all finding its home on the American Political Right. It is just a CERTAIN group of Americans that are going down the discredited path and boast about doing so. Hi Credence2, ditto (nice to hear from you). Yes I got the impression that it was a mix of greed and wilful ignorance on the American Political Right. How is this affecting the sale of electric cars in America? Applause to the small country that goes electric cars; you can be proud of your efforts. Now if you would just design an affordable car that will travel 500 Km on a charge we could use one in the states as well. And that doesn't take hours to re-charge, of course. Because, you see, the open spaces in the states don't have fueling stations every 50Km - it isn't that unusual to find that there is nothing - nothing at all - for hundreds of KM. And a quick recharge is necessary because, while a 1000 KM drive will get you from Iverness to Southhampton, it's just getting started in crossing the states - Miami to Seattle is 5300 Km and no one wants to spend 200 hours re-charging for a simple drive across the country. Can you help us out here? I require a hybrid (Chevrolet Volt) as of now, simply because electric cars are not practical in this country yet even if we had a few dozen re-charging stations in every small town. It isn't unusual for me to travel 1000 Km or more in a days drive, so that could be a starting point, say with no more than 30 minutes required to charge for that distance. Hi wilderness, nice to hear from you; and thanks for your constructive and valid points. Yes, I can see your dilemma, I agree that at the moment it’s only the very expensive (unaffordable) electric cars that can travel over 500 Km (300 miles) on a single charge. Although most of the cheaper cars will now do over 100 miles on one charge, which only makes them really useful for commuting to work rather than long distance travel across America. However technologies are constantly improving and prices are falling; so notwithstanding ‘politics’ e.g. successful lobbying from the fossil fuel industries in favour of ‘gas guzzling’ cars in the USA, it should only be a matter of time. The good news is that most ‘Public’ charging points in the UK (and across Europe) are ‘Fast Charge’ e.g. just 20 minutes to re-charge your car. So if you had enough ‘Public’ ‘Fast Charge’ points in America, then even in one of the cheaper models that need recharging every 100 miles (with 20 minutes a charge) the 1,000 Km (600 mile) journey you mentioned wouldn’t take the 200 hours recharging time that suggested but a more modest 3 hours. It’s not perfect, but it’s a start. But we don't even have buildings every 100 Km. I meant it when I said there is nothing for hundreds of Km. No buildings, no electricity, nothing but empty highway and an occasional billboard sign. So yes, it's a start...but unfortunately a start that does nothing for the entire western half of the nation. And even the commuting is questionable - I used to live next door to a man commuting 90 miles each way. A 100 mile range won't even get him one way at that rate (nobody runs the "tank" completely empty and adverse weather will absolutely defray that 100 miles to more like 75). I can go 40 miles, in good weather - just enough to get across town from where I live and most of the way back. Winter time I could not make the commute my wife used to make every day (25 miles each way), not unless the job location provided several hundred charging stations for employee use. I live in Boise, Id - a metropolitan area of about a half million. I saw my first all electric car yesterday. Hundreds of hybrids (mostly the Prius), but only a single all electric. Even in the city, electric cars are just not practical in the US - our commutes from the suburbs are just too far, and even if they weren't we still require a second car to get out of town. Britain has a long ways to go as well. On a recent tour of Scotland we stayed at a tiny village where there was a charge station. That would have to care for not only the villagers but the guests of the single hotel there - I just can't see a few dozen residents plus the 100 or so hotel guests getting what they need from a single charge station. With 300 mile ranges possible now, I see the problem mostly as a combination of lack of infrastructure AND long re-charge times. Tesla's "supercharger" requires 120+Kw of power - over 500 amps of 240V power or about 2 1/2 homes worth. With the massive number of such stations needed, and considering that the power will mostly be used during daytime (smaller chargers are available for home use overnight) we don't even have the power generating capability to charge an all electric population! While the total number of Kwh's are perhaps available, when one considers that it is nearly all daytime use it just isn't there. When it comes down to it, we need charges taking only 10 minutes or so, and we need about as many charging stations as there are petrol pumps. Plus, of course, a smaller station in each home. Our electric grid is based on how much power is required - it seems reasonable to add the requirements that burning gasoline/diesel for power (with an adjustment for efficiency differences) that all those cars and trucks use. It isn't there, not now, and with nobody approving of additional power plants it never will be. I agree with you, there are wide open spaces in America where there is nothing for hundreds of miles; where you certainly don’t want to run out of fuel, whether it’s petrol (gas) or electricity. In that respect it may be a few years before affordable electric cars with the same millage capacity (before refuelling) as petrol (gas) cars are available; but the high end cars can achieve that now, so it is only a matter of time. As you mentioned it; FYI, charging points at the work place is becoming more common in the UK, so people who commute to and from work can plug their car in at work for a top up; so when they start their journey home their car is already fully charged; then when they get home plug it in for a slow charge overnight, so its fully charged again for the morning. • Every new home built in the UK will include charging points for electric cars. • As already mentioned, an increasing number of companies are installing charging points for their employees. • Some of the supermarkets are fitting Public Charging points in their carparks. • Currently every streetlight (lamppost) in central London is being retrofitted with two charging points for public use (as a trial scheme); and if successful the scheme will be rolled out to the rest of the country. • All Motorway Service Stations in the UK have electric car charge points. • As of September 2017 there was around 4,800 different ‘Public Charging Locations’ in the UK with numbers currently increasing at about 20% per year; with anticipation that they will outnumber the 8,500 petrol (gas) and diesel stations across the UK within just a few years. • SHELL (Oil Company) is the first oil company in the world to install electric car charging points at a number of its petrol stations in the UK; with plans to roll it out further. • Rapid Charge (from 43Kw to 120Kw): Charge time in as little as 20 minutes e.g. used when travelling across the country. • Fast Charge (from 7Kw to 22Kw): Charge time in about 3 hours e.g. when charging at a work place. • Slow Charge (up to 3Kw): Charge time about 6 hours; primarily for home charging overnight. With advancement in new technology, the storage capacity of the Tesla batteries have increased by 40% in the last 12 months; which is a sign of things to come, as technologies improve. Yes, I understand your concerns of there not being enough electricity on your ‘national grid’ to support charging of electric cars. Even now, when you don’t have the added burden of electric cars taking power from the grid, I’ve heard about ‘brownouts’ being common in America due to the national grid being overloaded with demand; something which we don’t get in the UK, so I can only imagine how frustrating it must be at times. However, if America took Renewable Energies more seriously, and wasn’t so heavily dependent on fossil fuels, then perhaps ‘brownouts’ would become less frequent; if Europe and the rest of the world can transform their ‘National Grid’ with Renewable Energy then why not America? LOL Brownouts happen in the US, yes - nearly always because a part of the grid has failed, not because there is insufficient power. In the past it was more common, but not any more - I've never had one outside of failed grid in my life. Wait. 407 miles in 12 hours? That's less than 40 mph - were they driving on one flat tire the whole way? That shouldn't take more than 5 hours! No wonder you folks aren't concerned about longer trips - you can't make them anyway! Firstly, wilderness, if you’d noted my comment and watched the video, you’ll know that it’s an old recording so the electric car had less range than today’s cars, and therefore required re-charging twice as frequently. It wasn’t a race; the point of the video is that in 2011 such a trip in an electric car was almost impossible, so the road trip in 2014 was a ‘proof of concept’ e.g. demonstrating that it is now possible to drive from London to Scotland in an electric car. The car they chose was the model that had most sales in the UK at that time e.g. a bog standard cheaper more affordable model. Driving in the latest version of a similar car today, the same journey (with stopping for re-charge) would most likely take about 9 hours. For the ‘Record’, you stated that it should have only taken 5 hours to do the 407 miles; which would imply travelling at 80mph the whole way without stopping. I would like to remind you that the speed limit on Motorways in the UK is 70mph; therefore the shortest travel time (without stopping) is 7 hours (not the 5 hours you quoted). Besides for such a long journey, most British people would want at least one rest-bite at a Service Station during the journey; so in practice it’s likely to be more like 8 hours. For one of our summer holidays each year we always spend two weeks travelling around France and Belgium; about 2,000 mile round trip; but we don’t rush, my wife drives at a leisurely pace so that we can enjoy the beautiful scenery, and we quite often stop at quaint French villages for a rest and to explore. Thanks for your clarification about ‘brownouts’ in America; from what you describe it sounds more like blackouts, but I guess that maybe due to American and British terminology being different? I understand that about the car video, but the point does remain. My personal trips of around 400 miles (not unusual for me) never take over 6 hours unless there is a solid reason. Sighseeing, bad weather, etc. Speed limit here is 80 mph and most drivers travel 85 or so. Not that it all means a thing, except that we travel further, more often. I do have to agree, though, that with age I'm far more willing to take my time. No more straight through trips of 2000 miles for me! No, brown and black outs are two different things. Don't recall either one for many years, except as you note for bad storms or something similar. Wildfires, storms - that kind of thing. Many years ago I lost power for 10 days from an ice storm - probably the worst I've ever heard of for length of time without power. 20 years ago we would lose power for a few minutes almost monthly, but thankfully those times are gone, just as you say. Now it's mostly a car hitting a power pole, and even severe weather seldom has any affect (barring hurricane, tornado, etc.). I am surprised to learn that the speed limit in America is 80mph, from American TV programmes, I was under the impression that it was more like 50mph; but we live and learn. On British Motorways speed limit is only 70mph; on all other roads in rural areas (including country roads) the speed limit is generally 60mph, and in urban areas is just 30mph. Whereas, in France its 70mph on their Motorways when the roads are wet, and 80mph when they’re dry. In the early 1970s Britain was on a three day week due to the worldwide oil crisis; with power stations frequently switching off to conserve energy; and before Electric Mountain became operational in the 1980s brief power cuts were common; but those days are long since gone. These days, a constant supply of power in the towns and cities is probably one of the most reliable things in this country. Nathanville, speed limits in the U.S. vary state by state. As far as I can tell, only the states with flat terrain, like the deserts and plains states, have 80 mph speed limits. My state is very hilly, and our top speed limit on most interstate highways is only 70 mph. I think there may be a couple with stretches of 75 mph. It is reduced to 60 mph when we turn off for the last 40 miles of our trip to our hometown, which is a 4-lane state highway without controlled access. Anyway, Wilderness has a point. A round trip home is approximately 200 miles for us, and that doesn't include in-town driving. To drive to see our grandchildren is about 1,200 miles round trip excluding any in-town driving, so I drive a hybrid, a Toyota Prius. It is my second one. I bought the first one in 2010 and we stick with them. We do keep our eyes out for any improvements in electric cars, but for now, one would be impractical for us. But some of us hybrid drivers are being hassled on the road by yuppies and rednecks in large pickup trucks and some SUVs. I mean to the point of danger. Even one of my female cousins, an ultra conservative, made a snotty remark on social media about Prius drivers getting in their way. I don't like this attitude that "big is better and big rules!" I can afford to drive a gas hog, but I don't see the point. I'd rather spend the money on eating out or something that I can be proud of rather than enriching the pockets of big money oil. Thanks for the clarification MizBejabbers. There are some people in Britain who choose to live in villages and commute to the city for work, who do a lot of driving, but perhaps not on the same scale as America. Most people in the UK tend to use public transport to get to work, but for those who drive, the daily round trip to work is miniscule compared to America e.g. Bristol (where I live), with a population of 428,100, is just 10 miles in diameter; so both my wife and son only drive 10 miles round trip a day to get to and from work (50 miles a week in total). Likewise, when we visit our friend in Portsmouth or my brother in London it’s only a couple of hours drive on the Motorway (at 70mph) and we’re there. The one thing I do find intriguing about British roads is our country roads. In the summer we frequently take day trips on weekends, and usually a week’s holiday somewhere in Britain each year. Unless it’s just motorway from one urban centre to another, it doesn’t matter where you go in the UK (even in the more densely populated area of Britain, in the South East in England) travelling between the villages invariably means travelling on lots of country roads; most of them just single track lanes for two way traffic. Although they may be single lane, and twist and turn with lots of blind corners (where you might meet oncoming traffic); the speed limit on country roads in Britain is 60mph. If and when you do meet an oncoming car then one has to reverse to a convenient spot where both can pass; but surprisingly, there are remarkably few accidents e.g. UK roads are the 3rd safest in the world with just 2.9 deaths per 100,000 people; compared to the USA where its 10.6 deaths per 100,000. Thanks Credence2 for your feedback; I didn’t realise there was quite so much effective opposition to the electric cars from the fossil fuel lobbyists in America, although I guess it’s not surprising; it must be really frustrating, for people like yourself, who want to see an orderly progression towards the introduction of electric cars in preference to continued dependency on fossil fuel vehicles. I’m sure in time, once the technologies have advanced sufficiently, and when American’s see what the rest of the world has achieved, that attitudes in America will change; then perhaps the lengthy process of phasing out the use of fossil fuel cars in favour of electric cars can begin in earnest. CO2 readily breaks down in the atmosphere in about 2 weeks. NO2 is about 385 times more potent as a green house gas. 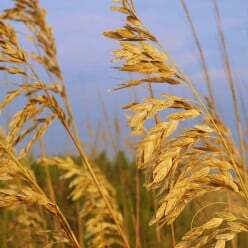 This is released in large amounts when growing hybrid crops like corn for bio fuel. Mining and processing the Nickel for the batteries of a Toyota Prius creates more pollution than a gas guzzling sports car in it's life time. A 15 million dollar wind mill can only supply 600 homes: as long as the wind keeps blowing. That is $25,000.00 per house just to get on the grid and upwards of $1500.00 a month for service and delivery. The same people who worry about CO2 emissions pay ten to twenty dollars a gallon for their little bottles of water while the refuse from this habit is killing our oceans. Mans footprint on the atmosphere is far less worrying than the plans being forged to erase it. Ice does not accurately reflect atmospheric CO2 levels, and scientists cannot accurately age ice fields. There is too much theory to environmental science and very little substance. It is the credibility of these scientists that people refuse to believe. Science is not supposed to be a religion. Thanks for your comments Setank. I agree that plastic bottles is a serious problem, and one which Europeans are looking into resolving e.g. proposals in the UK to charge a deposit on plastic bottles which is paid back when you return the bottle. However, there are inaccuracies in a lot of your statements, and your costings are likely to be out of date because they don’t reflect current costs; certainly not in Europe where we’ve been developing ‘Renewable Energy’ on a big scale for over a decade, so the infrastructure is already laid, and the initial costs of research and development is now paying for itself. Firstly, CO2 (Carbon Dioxide) actually takes from 20 years to 200 years for 65% to 80% to be dissolved into the oceans with the rest taking hundreds of thousands of years to break down more slowly within the atmosphere. So its release into the atmosphere does have a dramatic cumulative effect on climate change; plus a too high a concentration of CO2 in the oceans (overtime) has other adverse effects on planet health. In contrast, the N2O (Nitrous Oxide) which you reference, only takes 114 years to break down in the atmosphere; so its effect on climate change isn’t so long lasting. Although the release of any greenhouse gases, including CH4 (Methane) into the atmosphere should be controlled where possible. For example, Methane (as most people know) is 25 times more potent than CO2 as a greenhouse gas, but fortunately it does breakdown in the atmosphere within just 12 years so its effect on climate change is relatively short-lived. The costs of ‘Renewable Energy’ has fallen significantly in recent years (in Europe at least); so much so that in 2016 (for the first time) the cost of ‘Renewable Energy’ dropped below the cost of coal and nuclear energy. Britain’s first tentative step towards ‘Renewable Energies’ began in 1991 with the opening of its first commercial ‘onshore windfarm’; consisting of just 10 turbines with a total output of just 400 KWh. Then, our first offshore windfarm was in 2003; consisting of 30 turbines with a modest total output of only 1,000 MWh. Today, we have 8,023 wind turbines in the UK, giving a total average output of 16.6 gigawatts per hour; supplying 11.5% of the total electricity used in Britain (and increasing yearly). Just one single rotation of one of the latest eight-megawatt wind turbines being installed offshore will cover the daily electricity consumption of an average British household. Of course, it’s not just wind in the UK; Renewable Energy is also generated from Hydropower (we have four large ones in the UK), Wave, Tidal, Solar, Biomass, and Geothermal. An average of 30% of Britain’s electricity needs is now being met by ‘Renewable Energy’, and in fact on Friday 21st April this year Britain actually produced enough ‘Renewable Energy’ to go a full 24 hours without burning any coal for the first time since the start of the Industrial Revolution. I am going to stick with the principles of organic chemistry. Environmentalists rely on a general ignorance of this complex field. Most people realize that humans are ruining the planet, they just do not trust what they are being told. As to your puzzlement over American ignorance I refer you to our education system; The worst and most expensive in the Western World. I do like your article. Thanks Setank for your feedback, which is greatly appreciated. It's not so much the case of denial, but rather uneducated or misinformed! First let me state I am not an expert, and don't claim to be. Second, I recognize that climate change is real, but that is not to say I believe mankind has a significant impact on it through CO2. So one of the 'theories' about how and why creating CO2 is so bad, is that we are releasing stored up 'fossil' carbon back into the atmosphere, but this is not true, or at least inaccurate since oil is not a fossil, or a previously living organism that stored or became a carbon based product. Now, if you do your research on who was behind the Paris Accord, what the agreements were (China and India would not be penalized at all for increased Carbon emissions while countries like America got slammed for them) and more importantly the Carbon Tax initiative, you would learn this was a way for those who would control this new tax to increase their monopoly over certain industries and corporations, making it possible for them to tax competition out of existence, while also passing on a tax to everyone living in North America or the EU. I am ALL FOR tackling issues of poisons in our water, plastics killing all life in our oceans, nuclear power plants that are failing and killing our planet... I mean we have a lot of serious issues we ignore, probably because they are not politicized and not publicized by anyone of note. But that is just it, we have serious issues we are ignoring... while this 'global warming' scare is being pounded away at us by politicians and propaganda venues. Its not something that will be fixed by new TAXES and giving our government(s) more ability to control us than they already have. Hi Ken, Leroy Fletcher Prouty (who talks about ‘Abiogenic petroleum origin’ in the video link you give above e.g. an unproven theory that oil isn’t from organic origin) isn’t a scientist. He’s was a retired Colonel from WWII, who died at the age of 84, 16 years ago; so he’s not exactly qualified to make sound scientific claims. Regardless to whether you believe in oil being a fossil fuel or believe in ‘Abiogenic petroleum origin’ it doesn’t alter the fact that burning oil releases CO2 into the atmosphere; the effect and damage on the environment is the same. And regardless to what you believe the origin is for oil and natural gas it doesn’t alter the fact that increasingly, the only way to extract the new finds of oil and gas is ‘Fracking’, which most sensible people understand as being a process that is very damaging to the environment e.g. increased risk of earthquakes, and polluting the water supply etc. • In 2017 (in just one year) Britain is averaging at about 2% (with the last coal power station scheduled to be closed in 2025); and on Friday 21st April 2017 (this year), Britain didn’t burn any coal for a full 24 hours. I agree there are other issues of importance e.g. plastics in the sea and nuclear power stations etc., and these are not being ignored (at least in Europe); in Europe there is plenty of publicity on these topics and through the efforts of ‘pressure groups’, things in Europe are being done to address these other issues. However, if you lived in Europe, you would know that ‘Climate Change’ is more than just ‘propaganda’ or just something for academic debate; ‘It’s Real’. I grew up in a climate that was cold and wet, with plenty of snow every winter and cool summers. Now (for many years, especially since the 1980s) I live in a climate that is not only mild winters (we’ve had no snow in Bristol since 2009) but our summers are getting increasingly hotter year on year. Thank you for the detailed reply, I appreciate your honest and earnest debate on this (or any) matter. Yes, he is a retired Col., perhaps you missed the part of his interview where he discussed being in meetings with the likes of Henry Kissinger, top CIA officials, Senators, Congressmen, top national leaders at that time in other words, so he is referencing information given to those leaders, when he was present with them. I have no idea how other countries operate who has access to 'top secret' information, but here in America, there are two channels of information, one is the government which includes the military, and indeed the military supersedes most other authority in fact if not in perception or law, especially when it comes to access of knowledge... and everyone else outside that loop of information. Having had, for a time right after 9/11 the responsibility of reviewing, tracking, evaluating all information sent to the Division Commander of the 101st Airborne Division from the 18th ABC and Pentagon, and as the NCOIC of SIPR and NIPR communications in and out of the Division EOC, I can inform you from first hand experience, that what you are told in the news, what you are told by scientists even, that hold prestigious positions in the most lauded universities, is most likely not what the 'real deal' is on a great many topics. There is nothing more discouraging than debating an issue with someone who actually believes what they are being told by a news source like CNN for example, simply because they report it, when through years of experiences while in the military, and even when out and holding positions where I sat in meetings where some of the most ranking EPA and DOE officials were present, I was made aware of events and information that was reported in direct opposition to the facts, or truth, of the matter. So do not discount what he has to say, as is explained by others as well, the depths with which they are drilling for oil today preclude the possibility that these are fossil fuels, but again, I am no expert, I only know that back in the 70s we were supposed to be hitting 'Peak Oil' with a decline imminent, and then again a decade or two later, and then again... yet it seems we are producing more oil, and more nations are using oil, than ever before. After a while, one has to suspect that perhaps we aren't so close to running out, as the 'experts' and scientists were claiming. Not back in the 70s, and not now. That may be true, but the issue remains that they are not held to the standards that America and the EU nations are held to... and as we all share one world, one atmosphere, it doesn't really matter if its China who is burning more oil than all the countries in the world combined, the issue is that they are, and that while America and the EU would have to pay carbon taxes out the wazoo, meaning you and I will pay more in taxes and energy costs, China and India are given a pass. The whole concept of they have to develop, and so they have to pollute the atmosphere and the oceans so that they can catch up to us... its a strange argument to make when one considers China is already the most powerful economy in the world, with economic growth far outpacing the EU or America. With some of the most advanced and developed cities in the world today. As for England and the EU getting free of coal use, that is great. And perhaps China and India would indeed follow suit, eventually, not sure if we will be able to breathe the air when they get to that point however... I mean if global warming is manmade, and they are continuing to produce the very causes of it at higher levels than America ever did, one might be concerned about that. Yes I believe global warming exists, but I believe it is out of our control, I believe any factor of things could be causing the issues we see today that we have no control over, and that our governments would never allow to become public because it would create world wide panic and civilization breaking down far worse than anything we are currently dealing with. If there was going to be a major event like a polar shift for instance, your government would not inform you. They would prepare, they would have bunkers under mountains and seed repositories to restart civilization with, there is plenty that would be done, but none of that would have to do with informing the population at large or preparing them for it. So focusing on ridding the world of its terrible, deadly use of plastics that are becoming so invasive into our foodchain, especially our oceans, that it is hitting toxic levels on a global scale. And working to maintain our water resources and keeping them from being contaminated by poisons...I'm all for it, but when the criminals we otherwise know as politicians start peddling to us the need to combat Global Warming and Climate Change with Carbon taxes and more regulations, no thanks, I'm not buying. Yes I did (diligently) watch the whole video, and pick up on the points you mentioned; in the same way as I was trained to do in my work. However, you should know as well as I do that ‘senior bodies’ in Government are not scientifically qualified and they are not always fed ‘factually correct’ information. Who has access to ‘top secret’ information in Europe is slightly different to the USA; in Britain, if it’s ‘National Security’ it’s likely to be the ‘Intelligence Services’ (MI5, MI6 and GCHQ) e.g. the ‘spy agencies’. If it’s other matters of ‘security’, of a ‘sensitive’ nature, or maybe of embarrassment to the Government if made public, then dependent on the nature of topic it may primarily be the Ministry of Defence (which isn’t the Military), the Home Office, or any other Government Department, with the appropriate Government Ministers and the Prime Minister at the head of the chain e.g. the Government maybe directing Government Departments or taking advice from Government Departments. Speaking for British Governments (which is where I’m most knowledgeable); British Prime Ministers all too often, don’t take advice from his or her own Government Ministers and Government Departments, they tend to more often than not rely too heavily on their own personal ‘Advisors’ whom they’ve personally picked, not for their impartiality but because of their political ideology. A prime example being Nick Timothy and Fiona Hill, Theresa May’s Joint Chiefs of Staff (Personal Advisors), who were forced to resign in June this year because of the disastrous consequences which they caused the Conservative Government when the Prime Minister followed their bad advice that was out of touch with reality. Likewise, I have first-hand experience of the workings of Government (British Government) in that I was a Government Employee all my working life (until I took early retirement), and I have been privy to ‘sensitive’ information at various times in my career; (which I obviously can never divulge because I had to sign ‘Official Secrets Act’ when I first joined. Therefore, I do know that things do go on in Government circles that the ‘Public’ never hear of; albeit mostly for political reasons rather than the good of the nation. However, things are not as secretive in British politics as they use to be in that in recent decades British Governments have adopted a philosophy of ‘Transparency’, and to aid that introduced the ‘Freedom of Information Act’ in 2000. As regards the scientific community; I do have some scientific qualifications, and I do know how the scientific community works better than most people. I can understand how easy it is for the layperson to so easily get mislead by ‘newspaper’ headlines following a scientific publication; and then get confused by conflicting reports. The big mistake is the newspapers giving the impression that a scientific report is ‘fact’ when in actual fact it’s quite often only a ‘research’ report; that may even be in the early stages of research and therefore likely to be subject to adjustment as further research is completed or the report is scrutinised by other members in the scientific community who subsequently highlight flaws in the research. Therefore, when reading about scientific research it’s dangerous to just accept what you read in newspapers as fact; you need to know what stage the research is at and whether the rest of the scientific community supports the findings; a good source to follow the debates is in journals like ‘New Scientist’. In the last 10 years of my career part of my responsibility was report writing; making conclusions and recommendations. In doing that work, I learnt the hard way (early on) that for my reports to be accepted by senior management (most of whom were better qualified and more experienced than me), the information I wrote had to be factually correct and ‘evidenced’. And to ensure the evidence stood up to their scrutiny, I had to ensure all the source information was ‘genuine’ and verifiable; and not just based on suppositions. I may have only been a little cog in a big wheel but my diligence in research paid dividends in ensuring my reports made a small difference in people’s lives in the UK. Whether we are running out of oil or not is immaterial; the fact remains that burning oil is bad for the environment and increasingly, fracking is needed to extract the oil; which is also bad for the environment. You forget that Europe and America industrialised almost two centuries ago, and has long since modernised its industrial base; while China and India (until recent times) were predominantly agricultural economies with old industries and infrastructure which are heavily dependent on coal. Therefore, their need for electricity is growing exponentially as they transition from an agricultural and antiquated industrial base economy to a modernised industrial base economy. As regards to China burning more coal and oil than the rest of the world; (unlike America) they are doing something about it e.g. momentum was slow at first, but with the need to tackle pollution (smog) and a desire to meet their targets for reducing carbon emission, each year since 2014 coal and oil has become a noticeably smaller percentage of their total energy mix, with Renewable Energy becoming more prominent each year. To put China’s efforts into perspective; it should be noted that China’s population is huge by any standards. In this respect, although in 2014 their ‘Carbon Footprint’ accounted for more than a quarter of the world’s total ‘Carbon Footprint’; China does make up one fifth of the world’s population. • In 2014 the carbon emissions from China made up about 28.8% of the world’s total emissions (China’s population = 1.379 billion (2016). • In 2014 the USA carbon emissions totalled 14.3% of world’s emissions (USA population = 323.1 million (2016). • In 2014 the EU’s carbon emissions totalled 9.6% of the world’s emission (population = 743.1 million). As can be seen above, China’s population is four times larger than the USA, yet their Carbon Footprint is only twice the size of the USA; and the EU with a population twice the size of the USA has a Carbon Footprint one third smaller. Climate Change isn’t yet out of our control, that is if America takes the lead from the rest of the world and starts to take Renewable Energy seriously; but if America continues to drag its feet over the issue then yes, when America wakes up to the Climate Change Crisis it will be too late. I don’t see why engaging in Renewable Energy should be such an issue. In Britain and across the rest of Europe we are now seeing the great benefits of Renewable Energy, and while the rest of the world moves forward, America is being left behind. Can it be true that America is ‘right’ and the rest of the world is ‘wrong’? Great post, excellent source of information. I have copied/pasted it so I can review it in more depth later. America in many ways is a slave to Corporations like no other nation on this planet ever has been. Sadly the truth is, we are mercenaries for corporate greed and the petro-dollar, we have not developed renewable energies, the electric car, or anything else of significance when we could have lead the way in that 30 years ago... we could be a completely free from oil nation today. America is the might behind the coming destruction of the EU and Russia, America is the reason why North Africa and the Middle East is a gutted out warzone, and those efforts were deliberate and well planned out, as was the consequences to the EU for those actions, by those who control the strings of the politicians in D.C. Almost a decade ago now, I was privy to renewable energy, energy conservation, and state of the art efforts right before the 1 Trillion dollar American Recovery and Reinvestment Act was rolled out... I sat in meetings where how that money would be dolled out, why, and what the real purposes of that money and programs were, was presented. I watched as companies that invented helix wind turbines and solar energy panels that should have reshaped our world were quietly snuffed out, or bought out. The bulk of ARRA went into various pockets of those who knew how to collect it, tens of billions were funneled back to the re-election efforts, and at the end of it all we were not one step better off, not one step closer to being free of fossil fuels. To say that what I've seen/know is depressing, would be an understatement. Hi Ken, and thanks for your honesty. I know what you mean; it is depressing to see both America and Britain on self-destructive paths (for different reasons), when both nations could be so much better. China is on the rise, and the EU will become a more robust nation (as it always does after any crisis); so Britain’s and America’s prominence on the world stage will almost certainly move down a peg or two in the coming years. I would like to see Russia ‘take a leaf’ out of China’s book, but that I fear would require a change of leadership (so maybe in time). India has a long way to go, but is heading in the right direction. North Africa and the Middle East have a lot of problems to resolve, which is likely to drag on for generations, if not centuries. Although (because of its arrogance) Britain occasionally makes big mistakes that forever weaken its position in the world, it is innovative by nature and has a good track record of finding solutions for survival and growth. Like the EU, Britain tends to be at its best in being innovative to find solutions when it’s under the most pressure. However, I’m not sure how America can sever the strong links between corporations and politicians, or even if it’s possible? I'm not going to touch the climate topic but would say that perhaps in the era of fake news we live in, no one trusts any site or source of information completely. And with the experts receiving grants and funding from agenda-driven donors, it makes people suspicious of the results of many studies. Your proof is someone else's hoax, and vice versa. What I find strange is that people are suspicious of scientists and newspapers, but they seem to believe everything that big corporations say. So, for instance, when bottled water companies convince us it's not safe to drink tap water, we don't question it (even though the result is that they make millions from us buying the stuff). When car makers and fossil fuel industries spend millions funding lobbying groups and quasi-research foundations to convince us climate change is rubbish, do we really think they're doing it for our well-being? And don't tell me they wouldn't do it if it was really harmful. Look back at history. The companies that made leaded petrol kept on making it, even when they realised it was killing their employees. Cigarette companies kept on making cigarettes even when they knew it caused lung cancer. Asbestos companies kept on selling asbestos even though they knew it was lethal (and they're still doing it, in Africa). Profit rules, even if it kills. Hi Marisa; thanks for your input. I know exactly what you mean about drinking water; when the standardised ‘Regulations’ were first rolled-out across Europe the required safety standards for tap water was far higher than that of bottled water. Looking at the latest ‘Standards’, they are broadly similar these days for tap and bottled water; but interestingly in the UK bottled water only has to comply to the same exact standards as tap water when its ‘supplied as an alternative to the usual piped supply’ e.g. in emergencies; although in practice I suspect compliance is the last thing on ‘authorities’ minds in such an emergency. I’ve spent a lot of time and energy re-educating a close friend, who used to waste a lot of money on bottled water, that tap water is as safe (if not safer) than bottled water. It has slowly sunk in, but it does demonstrate your point on the ‘power of the media’ in persuading people to buy stuff they don’t need. Albeit in the UK the Advertising Industry ‘Self Regulating Authority’, the ASA (Advertising Standards Authority) does prohibit ‘Adverts’ from making false (or misleading) claims; so in the UK ‘bottled water companies’ are probated in making claims like bottled water is safer than tap water. I’ve recently spoken with my Australian cousins at some length about ‘Renewable Energy’ in Australia, but I haven’t yet asked them about their views on electric cars. As you may have seen from these discussions, electric cars are rapidly becoming popular in Britain and across Europe, as they are in China; so much so that our respective Governments have set dates for when petrol (gasoline) and diesel cars will be banned on our roads. In the UK the sale of new petrol and diesel cars will be banned in 2040, with the aim that existing petrol and diesel cars will be banned by 2050; although there are calls from some pressure groups to bring these dates forward by 10 years e.g. 2030 and 2040. Albeit in practice, with the rapid increase in sales of new electric cars there are likely to be relatively fewer petrol and diesel cars left on British roads by 2030 anyway e.g. the average age of cars in use on British roads is about 8 years. Therefore I am curious to learn what the state of play is in Australia e.g. are electric cars becoming rapidly popular (as they are in Europe) or is the take-up of electric cars slow, as with America. Hi RJ Schwartz; you raise some interesting, and valid, points. I wish it was true that “no one trusts any site or source of information completely”. Unfortunately, too many people will too readily trust any published claim ‘at face value’ when it supports their own personal views, without making any effort to ‘fact check’ the validity of the claim, or the source. This is particularly true with politics e.g. I’ll more readily accept claims made by the Labour Party, than by the Conservatives, because I’m a Socialist. Albeit, having studied a number of relevant subjects at College, as part of my qualifications in ‘Business Administration’ including Mercantile Law, Business Accounts, Statistics, Economics and Economic History, I can scrutinise Labour’s ‘economic’ claims at an academic level, before satisfying myself of their validity. However, not all ‘News’ is just ‘political’ bias or ‘spin’, a lot of ‘news’ in newspapers and published on the web is propaganda (at various levels), which can include ‘hoax’ (fake) news. It’s nothing new; Victorian newspapers were rather adept at using ‘fake’ stories as ‘fillers’ to fill spare space in their ‘news columns’ e.g. the famous Paul Denton story about a Methodist Preacher in Texas, which was used as a news ‘filler’ in newspapers all around the world between the 1850s and 1880s. The difficulty is in knowing when ‘News’ or ‘information’ is based on ‘fact’ and when it’s ‘fictional’. I myself am rather ‘sceptical’ by nature, and like to check out the ‘source’ of the information before I put any credence to information; and having a scientific and analytical mind helps. I was also taught at College on how to research (as part of my course work), skills which became important later in life as part of my work. However, it’s not always easy distinguishing between true and false information, and sometimes the lines can be blurred because of political spin or bias reporting (misrepresentation) e.g. grey areas where information is based on an element of truth but presented (twisted) so as to mislead the reader. With respect to this ‘forum’ on ‘climate change’; I saw a link to one such website which was cited in a recent Q&A on HubPages, to debunk ‘global warming’ showing NASA photos from space as evidence that Global Warming is a hoax, but when I checked out the link given, it turned out to be a Fake NASA website; and when I checked out the research on the genuine NASA website I found the opposite to what the ‘fake’ site was claiming. As regards ‘experts receiving grants and funding from agenda-driven donors’; when scientists are funded by a specific ‘industry’ e.g. petrol (gasoline) car, smoking, health drinks, to look at the health benefits etc., then one can quite rightly be sceptical of their findings. However, speaking for the UK (as I don’t know how it works in the USA) a lot of the ‘research’ is done in university’s (often in partnership), and some (but not all) the funding for the research comes from ‘industry’ e.g. funding for university research funds come from Government funding, the EU, Charities, Industry and Commercial Organisations. In the UK it’s not a ‘free for all’; ‘Research’ Projects are bound by ‘Rules’ and ‘Standards’, and there’s little scope for unscrupulous manufacturers hijacking research for their own personal gain if it’s just to support unfounded claims e.g. due to a high level of ‘transparency’ in the British methodology for research which allows for any claim to be closely scrutinised. Since before the Industrial Revolution (which originated in Britain), Britain has a good track record for ‘innovation’. As a present day example pertinent to me, in Bristol (where I live), all nine major NHS hospitals work in close partnership with local universities for ‘medical research’; something my wife is proud of because the hospital where she works (in Admin), in partnership with Bristol University, developed the world famous ‘Bristol Stool’ chart. The UK’s latest windfarm went fully live yesterday, with 67 new wind turbines delivering enough renewable energy to meet 1.67% of our electricity needs. This is just the latest of a series of new wind and solar farms, and tidal and wave projects currently under construction to be completed by 2025. Currently (latest), the UK has a total of 6,566 onshore wind turbines and 1,569 offshore wind turbines (total 8,135); with this figure set to increase significantly over the next few years. Currently, the UK wind farms provide enough electricity for the equivalent of 11.355,850 homes (45% of our domestic housing stock). More importantly, these windfarms reduces the UK’s carbon footprint by 19,502,764 tonnes of CO2 per year. Wave and tidal energy is still new technology under research and development, but the UK is intent on being a world leader in this field; with the potential for wave and tidal energy to meet 20% of the UK's electricity needs. Latest Update; Britain now produces 53% of its electricity from renewable energy (of which solar energy plays a major part). This exceeds the UK’s target of being 30% reliant on Renewable energy by 2030 and is well on the way of meeting or exceeding our 80% target by 2050. How Does the USA Compare? Having seen your replies on the issues with electric cars and solar panels, and a whole array of other issues in America, including the politics; in spite of these issues, I would like to hear your thoughts on what progress you think America is making with Renewable Energy to combat climate change by reducing its carbon footprint. With some 70,000 turbines, the US produces more power from wind than any other nation in the world. Some states get 20% or more (30% for Iowa) of their needs from wind, and the overall total for the country is 4.7% of it's energy needs from wind power. This has been accomplished while keeping energy rates low: rates across the country are 5.5% lower in 2016 than in 2009. Industrial rates, at 7.1 cents per KwH are the lower than in other major economies, such as Germany, China and India. The US produces over 3,000 MW of geothermal energy, more than any other nation in the world, with 30% or the total world's online total capacity. A good deal more is used for heating purposes rather than electricity generation; much of Boise, Id where I live is heated geothermally. In 2016 the US had 40 GW (gigawatts) of solar power installed. It ranks 4th, behind China, Germany and Japan. Solar employment has overtaken oil and gas; in 2016 over 260,000 people were employed in the solar industry. The oldest solar plant in the world is in the US. Of course, some of this is offset by tearing down dams and closing nuclear plants: fish must be preserved and NIMBY is alive and well in the US. Very impressive, thanks wilderness for sharing the information; which I found a fascinating read. It’s refreshing to see some positive news from America, which gives some hope for the future. The achievements you’ve highlighted in wind, geothermal and solar energy are certainly worthy for Americans to be proud of. I can understand closing nuclear power plants, but with your reference to ‘tearing down dams; are there any worthy reasons for this e.g. you also mentioned ‘fish must be preserved’. If this is one of the main reasons you had in mind, without going into details at this point; in the UK anyone wishing to build or modify an obstruction e.g. weir, dam etc. on a river containing migratory fish and eels have to submit their design for a ‘Fish Pass’ (aka fish ladder) to the Government for approval. I assume there are similar procedures for building ‘fish passes’ in America? Therefore I would be interested to learn why American dams would be dismantled? I believe that it is greed on the part of the various fossil fuel industries, oil, gas, coat, etc., and the excellent brainwashing they do to the uneducated and the under-educated These industries foster a fear among blue collar workers that they will be out of jobs if these industries are replaced. In some cases, this may be true, especially among older workers who object to being retrained in new renewable industries, but for the most part, the renewable industries are wide open right now for employees. I can see where it would be a big jump for an older uneducated coal miner to be reschooled in electronic technology for solar or wind generation. Therefore, I can see where people in this category would refuse to believe in climate change in their own self interest, however, their younger family members should jump at the chance to train for higher-paying technical jobs. Regardless, there will be openings in factories to build equipment, installers, and then technicians to keep these industries running. Perhaps the general public is not getting enough information on replacing the old jobs with the new to convince them to look ahead. But why disturb the status quo among the rich fossil fuel industry owners and stock holders, I assure you, they ask? As long as they can keep convincing the Flat Earthers that there is nothing going on with the climate and that the world is a safe stable place as is, it will be difficult to change those minds. Especially if they can continue to convince these people that it is just a "lee-a-brul" hoax. Notice that it is the ultra conservative element and conspiracy theorists who insist that it's all a hoax. Thanks MizBejabbers for your comprehensive feedback; certainly what you say does strike a chord with my impressions of America gained from what I’ve heard and read. Fortunately in Britain (and across Europe) we don’t get the same resistance from the fossil fuel industries as is apparent in America. In contrast, in the UK where the sale of new electric cars since 2011 has been growing exponentially year on year, SHELL (one of the oil companies in the UK) has taken the attitude of ‘If you can’t beat them, join them’, in that this month they’ve opened the first of a series of electric car charging stations across the UK. Climate change = winter ,spring ,summer , fall. I just love all this talk of electric cars , Liberal environmentalist -"Just go home after shopping and plug it in "............Passing the coal and nuke power plants on the way , talking on the mineral expensive smart phone when you order your new car. Aren't we are ALL equally technology terrorists ? Hi ahorseback, good to hear from you. It may be ‘Fall’ in America, but it’s currently ‘Autumn’ in the UK; although at times it feels more like late summer due to the mild weather. Yours graphic description may accurately depict America, but not quite so apt for Europe. About half of Europe doesn’t use nuclear power stations, with Germany being the latest to decommission them. In 2010 Germany’s 17 nuclear power stations provided 22.4% of its energy needs; but immediately following the Fukushima nuclear accident in Japan in 2011 the German Government decided to decommission all their nuclear power plants in favour of Green Renewable Energy e.g. solar and wind etc. In 1956 Britain was (unfortunately) the first country in the world to develop and build the world’s first commercial nuclear power station. Since then we’ve built a total of 19, of which the oldest 11 have already been decommissioned due to their age. Of the remaining 8, all except one will be closed by 2025. There are Government plans, at an advanced stage, to build a new nuclear power station in Britain to replace the last of the existing nuclear power stations before it closes in 2035; but with spiralling costs of building the new plant, and with rapidly falling costs of Renewable energy, there are some doubts on whether it will actually be commissioned. At its peak in 1997, nuclear power provided 26% of the Britain’s electricity needs; currently nuclear power provides 21% of the electricity in the UK, but that will drop dramatically over the next few years as more and more of the remaining nuclear power plants close. As regards coal, although Britain is sitting on 200 years supply, all except one coal power station have now been closed; with the last remaining one due to close in 2025. Although we still have one coal power station left in the UK, most of the time these days it’s on standby e.g. burning the minimum of coal so that it can be up to full power within 12 hours if required; although, increasingly there are days when no coal is burnt in Britain. In 1990, 67% of Britain’s electricity came from coal; this year it’s less than 2%. Propaganda from the fossil fuel industry is the main reason. Yes Jo, judging from all the feedback, the common thread does seem to be propaganda as the big evil, feeding on the uneducated and the misinformed. I believe that most of us contribute to the ongoing and almost irreversible pollution of the planet on which our descendants will have to find a way of living. Short term thinking, laziness ( how many of us drive to the shops when we could walk, cycle or take a bus? ), corporate drive to profit and prioritisation of popularity on the part of politicians are all contibuting. I’m glad I’m not young any more. How the planet has changed, and continues to change, since I was a girl is terrifying. I worry for my grandchildren. Hi Glenis, I know what you mean. I’m not a natural ‘Green’ by nature; I use far more electricity at home than I should, and I begrudge the effort and inconvenience to comply with the Local Councils Recycling Regime. Although I too am no longer young (I took early retirement five years ago), I am a little more optimistic about the planet’s future than I was a few years ago (provided America doesn’t screw it up for us), in that I have been impressed with the speed at which Britain and the rest of Europe has moved towards a low ‘Carbon’ economy. With a Conservative Government in power (who is not renowned for their ‘green’ credentials) I was apprehensive that Britain wouldn’t meet its ‘Green’ targets. However, when I became aware that Britain reached its 2020 target three years ahead of schedule, and is now well on its way to exceeding its 2030 target, my optimism started to rise; and since then I’ve taken a more keen interest in the pace of development in Britain. So although I can’t say that the future is ‘bright’ for our grandchildren, there is perhaps ‘hope’? The link to the Tesla batter was interesting, but not sure I agree with the concept. I had a solar company out this year to give an estimate on installing panels on the roof and explain how it all worked. Here, any excess power from the panels is exported back to the grid and a credit given for any used during dark. The end result is the same for homeowners and for the power company, without using a battery and the materials/pollution required to make that battery. It even serves to smooth out, somewhat, the fluctuations in demand the power company sees. So why have one? Wilderness, perhaps your experience with the solar panel company, and the problem with the other property down the road, is an indication of the effect the fossil fuel companies are having on the market e.g. supressing the rollout of ‘Renewable Energy’ technologies in the same way that the railway companies in Victorian Britain killed the Canals to eliminate the competition? In the UK, and across Europe (if you have the money) installing solar panels on your roof is a good investment; not only does it increase the value of your property but you also get a full return on your investment within the first ten years; with the next 15 years being pure profit e.g. you more than double your investment over the lifetime of the solar panels. Yes (like America), in Europe, any surplus energy you produce during the day from your solar panels is sold to the National Grid, which helps to subsidise your usage during the evening. The added advantage of the Powerwall Battery is that once its fully charged, any surplus is still sold to the National Grid, so you still make money from selling electricity; but by having the battery, you then don’t have to spend money in the evening to buy it back. Although it may not be so financial profitable in America; in the UK (and the rest of Europe) it does actually work out to be economically and financially beneficial for the homeowner to have the battery e.g. you end up making more money during the life time of the solar panels (which is currently 25 years). Solar panels are rapidly gaining popularity in the UK. Last year just 3% of homes had solar panels, this year it’s doubled to 6% and on present trends it’s estimated that 40% of British Homes will have solar panels by 2020. Solar panels; something that has to be considered in my area is that nearly all the power is hydro electric - probably the cheapest method of generation around, and that makes the payoff quite difficult to achieve. Other areas pay almost double what I do for a Kwh of power - off peak charges here are just 7 cents per Kwh. Solar just can't compete with that, even with a 30% subsidy. Even without the tall mountain ranges I'm surprised England doesn't have more hydro power; our visit to Scotland gave me to believe that most of the power there was hydro. The battery; here it is a one for one exchange. Put the excess on the grid during the day, get back the same Kwh in the evening. With the battery, you don't get to put nearly as much on the grid, increasing the amount that must be generated. At night you use your own, meaning there is excess generation capacity available at the power company - capacity that must be paid for even if not used. Thanks for the explanation wilderness; that makes it easier for me to understand your viewpoint. Yes, of course, if you are getting ‘ALL’ of your electricity from hydroelectric then that is certainly a green renewable energy. I take it then, from your description that you don’t have a ‘National Grid’ in America, but ‘Regional Grids’? In the UK, all electricity production (except of course for the solar energy used by homeowners with solar panels) is fed into the ‘National Grid’, whether it be solar, wind, hydro, tidal, wave and coal etc. Scotland does have some hydroelectric plants that continually produce electricity; but I guess from your comment that your visit to Scotland wasn’t recent e.g. in the past few years other forms of Renewable Energy has become far more important in Scotland; including wind, wave, Tidal, Biofuels, Solar energy and Geothermal energy. In fact, Scotland has now become so proficient at meeting its energy needs from ‘Renewable Energy’ that for most of May this year it produced all its energy needs from just wind and solar; and Scotland now regularly exports up to 50% of its surplus electricity. There are also four main hydroelectric power stations in the UK, the largest being Electric Mountain in Wales. However, these hydroelectric plants are not constantly producing electricity; they’re only brought on line when there’s a sudden surge in demand for huge amounts for electricity. Such sudden surges in demand is a regularly occurrence during the week in the early evening when millions of British people all put on the kettle at the same time (immediately following the end of popular TV programmes); this phenomenon is known as ‘TV Pickup’. When a TV Pickup occurs the National Grid instructs two or more of these hydroelectric plants to become operational e.g. they can go from zero power to full power in seconds. The whole point of investing in Renewable Energy in the UK (and across the rest of Europe) is to work towards eliminating fossil fuel from the energy mix; so that Europe can be totally ‘green’ as part of its commitment to reduce the release of greenhouse gases e.g. carbon dioxide into the atmosphere in an attempt to limit the harm caused by ‘climate change’. Solar panels on people’s roofs are an integral part of that plan e.g. by making people almost self-sufficient in producing their own electricity means fewer power stations will be needed; a prime example of this policy working is where on Friday 21st April this year Britain didn’t burn any coal for 24 hours in its one and only remaining coal power station. Your last point seems to demonstrate another difference between America and Europe e.g. when there is potential excess generation capacity available at a power station in the UK, the power station is instructed by the ‘National Grid’ to either shut down (as happened with the coal power station in April), or asked to go on standby e.g. reduced power. In either event the power station doesn’t get paid for producing energy e.g. their on a ‘call-off’ contract. When the National Grid needs power it buys from the cheapest source first; which at the moment happens to be the off-shore windfarms; and coal is now the most expensive, so they are only used as a last resort. Our grid is two-fold, both national and regional. For instance, a few years ago we saw a hike in prices from our regional system because it had to sell power to California, where they refuse to build sufficient generation stations. That meant we had to use more gas and oil for production, raising our prices. Very complicated and I certainly don't profess to understand it all. Standby; not what I really meant. During the day, when industry operates and air conditioners are on the demand is high. At night the industry shuts down, air conditioning falls and demand falls. Without batteries this can be alleviated somewhat with homeowner solar cells, but when the batteries are used that value goes away. It's very, very expensive and difficult to start and stop generation plants, so it is seldom done. I suppose there is some during seasonal changes, but certainly not for overnight differences in need. Again, I certainly don't know the nuts and bolts of how it all works, though. We don't get ALL our local power from water, though, just most of it. Seems like something around 80%...until our region has to crank up fossil plants to sell to California. And we produce from wind and I think some geothermal as well though most of that is used for heating buildings. Scotland - we visited two years ago and viewed a hydro plant where water was being drained from one high elevation lake into a lower one, through the generators. Works just like a dam. We were told that there were several of these plants and that they provided most of Scotland's power. Not surprising that the tour guide was wrong though, is it? Our grid is also two-fold, both ‘National’ and ‘Pan-European’. Over 90% of our Energy is produced in Britain, but these days we also import a lot of ‘cheap’, green ‘Renewable Energy’ from Scotland who now frequently produce far more than they need; to facilitate that (within the last two years) two high power ‘point to point’ DC cables have been laid on the seabed between Scotland and southern England. We regularly export electricity to the Republic of Ireland and often import electricity from Norway and France when needed. High powered cables have recently been laid on the seabed linking Norway to Britain and other European countries; to take advantage of their abundance of cheap hydro-electric power. The electricity we buy from France sometimes comes from sunny Spain where they have an abundance of solar power; and in exchange (on less sunny days in Spain, and when it’s particularly windy in Britain) they can buy some of our surplus wind power. From what you are saying, there is a clear difference with energy usage between America and Britain. In Britain our peak demand for Energy isn’t during the day, it’s in the evening; so that’s where the Powerwall batteries pay dividends. The Powerwall batteries allows homeowners to use their own stored energy in the evenings (during the peak demand in the UK), and therefore when electricity is at its most expensive to the National Grid because the shortfall has to be made up from more expensive sources e.g. coal. • Producers e.g. windfarms, solar farms, and power plants etc. It’s the job of the Distributer (The National Grid Company) to buy from the ‘Producers’ and sell to the ‘Suppliers’ as required. The National Grid does this by buying the cheapest electricity first and the most expensive as a last resort e.g. each Energy Producer has to give its prices to ‘National Grid’. Suppliers can charge the Consumer what they like (to within reason) e.g. to make enough money for their CEO and shareholders; and it’s up to the Consumer to shop around for the best deal. In this respect I’ve just switched suppliers (last month) and now pay ‘Bristol Energy’ for my electricity and gas. The reasons for me switching to Bristol Energy (a new company launched in 2015) for my energy needs is twofold, firstly on principle because (unlike the big energy suppliers) Bristol Energy is a non-profit organisation who believes in keeping costs down for the consumer and who re-invests any profits they do make into ‘green’ projects in Bristol. Secondly, because Bristol Energy isn’t aiming to make a profit my new energy bill is 20% cheaper than what I was previously paying. When you visited Scotland, the tour guide may well have been right at the time e.g. hydropower was one of the prime sources of Scotland’s energy, but in the last two years (since 2015) they’ve almost doubled their Renewable Energy output; most of it now coming from wind power. We're essentially the same, with the pan american grid equating to our national grid. Our supplier, though, is the regional grid and the consumer cannot choose who to buy from; the infrastructure (wires, transformers, generators, etc.) belong to the regional grid. Consumer pricing, whether another region, business or residential, is set by law and reviewed each year so that the power company makes a reasonable profit but that's all. One oddity is that the federal government appears to operate the dams around - my son works for the Federal Bureau of Reclamation that does all the budgeting and money shuffling for the dams. Yet our local power company owns many dams outright and shares ownership of other, larger ones. From reading your reply wilderness I realise I’ve made one slight error (omission) above; namely that in the UK Distributors and the National Grid are actually two separate entities. The National Grid owns and maintains the ‘Grid’ itself e.g. the pylons, sub-stations, transformers etc., but the Distributors own and maintain the cables that makes the final link from the National Grid to the Homes. So for example, when a new windfarm is constructed the National Grid will install the new pylons to take the power from the windfarm to the Grid Network. Whereas, when a new housing estate is built its one of the 8 Distributor companies who make the final link from the National Grid to the new homes. For this purpose, the UK is divided into 8 ‘regions’ with a different Distributor company in each region. Beyond making the final link from the Grid to the Home, the Distributors have nothing to do with the Consumer; that’s the job of the ‘Suppliers’. In the UK, the Suppliers own nothing and are responsible for nothing, other than installing the electricity (and gas) meters in the home and billing the home owner for usage. The Suppliers was an extra layer of ‘Administration’ added by the Conservative Government back in the 1980s when they ‘Privatised’ the ‘Industry’. The idea of the ‘Supplier’ was the Conservative’s way of trying to make the ‘Industry’ competitive through competition by offering the ‘Consumer’ choice; although in practice it just pushed up prices. So in reality, it doesn’t matter which ‘Supplier’ you opt for (to pay your bill to) it’s the same wires and the same electricity that you get from the National Grid; so it’s nothing more than just a paper exercise. So in the UK, if you want to switch suppliers you just phone up the supplier you want to pay your bills to (give them all the relevant details) and they do the rest e.g. they agree a switch over date with the old supplier (on your behalf) usually about 30 days later, and it’s as simple as that. The price of solar and wind generated power is coming down, or so the news story on TV last week stated. Must be because my neighbor just had solar panels installed on his roof. We have three small panels and a battery bank that generates enough power to run a couple of lights and keep our cell phones, laptops and tablets charged. My husband is an electronics engineer and has kept up with the prices for years. He decided long ago that it was cheaper to pay the electric company than to generate our own power. Our laws are just now loosening up to consider using alternative power anyway. In some places, people going off the grid have been fined and ordered to go back on because there was such a powerful lobby for big money nuclear and coal-fired electricity. We live outside the city limits, but the city code requires that a household be connected to utilities, and that if a resident disconnects, they can be fined $250. That applies even if there is a disconnect for nonpayment, and the resident can't pay the money owed the company and scratch up the deposit, which is usually about $300. Talk about kicking a person when he is down. Yes the cost of Renewable Energy (especially wind) is dropping dramatically year on year (at least in Europe), so much that since 2015 Renewables have become cheaper than fossil fuels. The two main causes, driving down prices, is the continued advancement in technology due to research and development e.g. bigger and more powerful wind turbines, and the economic benefits of mass take-up by the consumer (the economies of scale for marketing solar panels as more people want them installed). In Britain, Scotland is taking the lead in research and development for many of the tidal, wave and wind technologies; and they have a number of test beds in the sea where various trials are taking place. Having solar panels on the roof and a Powerwall battery doesn’t mean going off-grid (not in Europe at least), it just means that you are predominantly self-sufficient in electricity during the day from the solar panels and at night from the stored energy in the battery. During the daytime, once the Powerwall battery is fully charged from the solar panels on your roof any surplus electricity you generate is sold to the grid, then during the evening (especially in the winter), if by chance there isn’t enough charge in the battery then you can make up the shortfall from the grid. However, coming from a country where the Government is actively encouraging people to use electricity more efficiently e.g. energy saving lightbulbs and well insulated houses, and encouraging people to become more self-sufficient in producing their own electricity with solar panels (specifically to reduce our reliance on fossil fuel and nuclear power stations), I am a little (although not totally) surprised that America is discouraging people to go off-grid in order to promote the continued use of fossil fuel (and nuclear) power. Government doesn't do much to encourage energy saving, except to provide subsidies of various kinds. You can get govt. help for insulation, energy efficient heating sources, etc. But my local power company will give you LED light bulbs, low flow shower heads, timers on hot water tanks, etc. I have enough LED bulbs on hand, for example, to replace all the fluorescent bulbs in the house as they burn out, mostly from the power company. I think there is more to requiring a connection than just utilities wanting money. Cities require it in order that the home not become a blight in the city - few homes can generate the power that modern living requires. Crudely put, the city doesn't want you camping out in the city. Most homes today are fitted with the potential to draw 48Kw of power - it's not easy at all to get that kind of power from solar, wind, etc. and energy storage requirements make it almost impossible. I assume you mean 48Kw in a day e.g. an average of 2Kwh (2Kw per hour); which in Britain is about the average usage. If so then the solar panels being installed on British roofs generate up to about 3KWh (during the summer months), which is more than sufficient for usage during the day, and the latest (Mark II) Powerwall batteries now have enough capacity for 5Kwh, which is more than sufficient to last the night. That's odd. What are you paying the supplier for, then? They don't deliver power, they don't service the infrastructure, they don't seem to do anything at all, except perhaps maintain the meter at your house. In the US, the meter itself is owned by the power company, although the enclosure, wire terminations and everything else is owned by the homeowner. Meters have a standard connection everywhere, so any base/enclosure, whether full of circuit breakers or nothing but wire terminations, will work. My meter base, for instance, is outside on a pole and carries breakers for the house, for a separate shop building, a few outdoor outlets and a pole light, but most have nothing but the meter and wire terminations. It is illegal to tamper with a meter - only the power company can break the seals or remove it In theory anyway - I did once, very carefully so the seal could be re-used, to replace the main breaker in the panel, which I own and needed replacement. I fully agree with you wilderness, it is an odd arrangement. Prior to the 1980s the whole Industry was State owned and run; but the Conservative Government at the time privatised the gas company (British Gas) in 1986 and the electricity companies in 1990. Prior to 1990 Britain was divided into Regions with an electricity company (Distributor) in each region being responsible for everything between your house and the National Grid (including the meter); and for taking the meter readings and billing you for usage. In the South West of England at that time (before privatisation) it was SWEB (South West Electricity Board) who were responsible for electricity supply to the home. However, when the Conservatives privatised the industries they felt there was no scope for competition to bring down prices; so they invented this bizarre system of creating ‘virtual’ suppliers who charge you for your electricity; and because they don’t physically supply the electricity and gas (it’s just a paper exercise) any number of companies can vie for your custom. In the UK, entering each property is a 415v, 100AMP breaker; which maybe in a weatherproof box on the outside wall, or somewhere inside the house; in our case it’s just below the meter cupboard in our hallway. The Distributor Company is responsible for that breaker (which is protected by a seal) and for everything from it back to the National Grid. The ‘Suppler’ is only responsible for the meter (which converts the 415 volts into 230 volts) and is wired into the breaker; and likewise the meter is protected with a seal to prevent tampering. If you change supplier you don’t have to change meters, but if the meter does require replacement e.g. as with the current rollout of ‘Smart Meters’, then the supplier will install their own meter, which has to meet ‘set standards’ but otherwise can be to their own design. In the UK, Back in 2015, the Conservative Government instructed ‘All’ Suppliers to install ‘Smart Meters’ to every home in the UK (free of charge to the customer) by no later than 2020. It’s proving challenging because it’s new technology and the technology isn’t quite ready e.g. the Smart Meters’ require a good Wi-Fi signal to function properly and as virtually all British homes are brick, in about 20% of homes the signal struggles to get through the thick brick walls. So all the suppliers (while rolling smart meters (where they do work) are busy developing a 2nd generation of smart meters that will work in all homes; but the speculation is that the Government may have to grant an extra year for the suppliers to complete the installations in those homes where the current version of smart meters don’t work. However, in homes where they do work, they are brilliant. Not only do they automatically send meter readings to the supplier in ‘real time’ but each house holder is also given a free ‘smart monitor’ which usually sits in their living room that gives the home owner detailed usage and costs of the gas and electricity they’re using; which makes people acutely aware of where they are using power and how much it’s costing. That sort of information in-your-face does make people more inclined to switch things off when not in use and invest more in energy saving lighting e.g. LED, etc. From the meter onwards it’s the customer’s responsibility e.g. the meter feeds into the fuse box (which the customer owns) and then from the fuse box to the various circuits throughout the property; with the fuse box containing the various fuses for all the circuits e.g. upstairs mains (32Amp fuse), downstairs mains (32Amp), upstairs lights (6Amp), downstairs lights (6Amp), Cooker (32Amp), Shower (40Amp), and Garage or shed (16Amp) etc. Although under current law, if the customer changes the fuse box or has any electrical work done they should have it done by a qualified electrician; albeit if you want to do the work yourself everything is freely available in the DIY stores. Recently I had my fuse box changed from an old fuse box of just 8 fuses to a new one (230 Volts, 100Amp fuse unit) with 10 fuses (plus 2 master 64 Amp RCD fuses), because in recent years I’ve added extra circuits to the house e.g. the conservatory which I built a couple of years ago and power for the garden sheds at the end of the garden. Below: The new Fuse Box I had installed. The Meter is on the left (which belongs to the Suppler) and the Consumer Unit (Fuse Box) in the centre, which is my responsibility. The Breaker is below the meter, and out of shot so not shown on the photo. Where does the WiFi come from? Are home owners required to have internet access with a router installed, or is that the power companies responsibility? We have smart meters where I live, new about 10 years ago or so. But my understand is that they transmit information back over the power lines; certainly they don't use the internet or WiFi. Because the smart meter reads constantly, I can now pay for my power based on not only how much I use but the time of day it is used; night time is considerably cheaper. Summer time rates are 7 cents off peak, 12+ cents on peak; that's a pretty good incentive to put off high use appliance use until after 9PM whenever possible. Of course, I only charge the car at night, unless I know I'm going out and won't have enough battery. Interestingly, I made the switch to Time of Day fee scheduling at the same time I bought my plug in hybrid car. With some management of our lifestyle and when we use power, my electric bill never changed. The KwH used went up with the car, of course, but my cost actually went down slightly. Your 10 "fuses" (we call them breakers) is almost scary. Even recognizing that you use 240V instead of the 120 that does most of our homes, it's still scary. We're limited by law to 42 circuits, and most homes don't have too many empty spots in the panel. Nearly all homes use a 200A main breaker, though, providing twice the power you get; maybe that's part of it. The Wi-Fi for the Smart Meters works in a similar way to how ‘Smart Phones’ connect to the Internet e.g. from the sky, presumably satellites, so it has nothing to do with the home owner; and is the responsibility of the Energy Supplier (power company). It’s because the signal comes down from the sky, where it connects the smart meter to the Energy Supplier’s website via the Internet, that for some homes the signal struggles to get through the thick brick walls. It is new technology that is being developed, so I’m sure most of the teething problems will be sorted before the deadline of 2020 that the Government has set the Energy Suppliers to complete the installations. In any event, even with the current level of technology, it does work in 80% of homes so most homes in the UK will have smart meters within the next couple of years. Coming into the house is a single 415 volt, 100 Amp, fuse (which just pulls out to break the circuit); this belongs to the Regional Distributor Company; I guess this is what you would call the main breaker. The Live and Neutral feeds go from the ‘Main Breaker’ to the ‘Meter’, which also converts the 415 volts to 230 volts AC. The Meter belongs to whichever ‘Energy Supplier’ you choose to be with. The Live and Neutral feeds then go from the Meter to the Fuse box (aka Consumer Unit), which you call breakers; this belongs to the house owner. It’s from this fuse box that all circuits are wired for the house; using the appropriate rated cable and fuse for each circuit. The total load for the fuse box is 100 Amp (the main red switch at one end). But these days (the modern fuse boxes) also include two 64 Amp RCD (Residual Current Device) fuses; which will trip if a fault is detected on the circuit e.g. earth leakage or faulty wiring etc. The normal fuses will trip if you overload the circuit e.g. using too much power on that circuit or there’s a short. 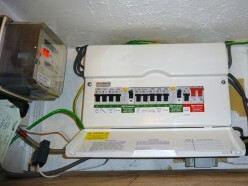 The RCD will trip if there is an earth leakage or other power irregularities are detected. The individual fuses are split into two banks, with each bank protected by one of the RCD fuses e.g. if the RCD trips then power to all the fuses on that bank is shut off. For individual circuits the main six circuits are upstairs lights, downstairs lights, ring main upstairs, ring main downstairs, Cooker, and Shower; although these days it’s not uncommon to have 10 or 12 or more circuits e.g. garage, kitchen, outdoors, heater, additional lighting circuit etc. And it’s not uncommon to split the 100Amp cable from the meter to feed two separate 100Amp fuse boxes if you want loads of circuits, and it’s perfectly safe in that the overall load is ultimately protected by the main 415v, 100Amp breaker that feeds into the meter. All wiring is 100% copper and earthed, with the earths feeding back to the fuse box and then onto ground. • A lighting circuit uses 1.5mm copper wire; and is fused at 6 Amps: maximum load = 1,380 Watts. • A Ring main (sockets) uses 2.5mm copper wire; and is fused at 32 Amps: maximum load = 7,360 Watts. • Radial circuits for mains power e.g. cable does not return to fuse box, so current can’t go both ways; using 2.5mm copper wire: are fused at 16 Amps: maximum load = 3, 680 Watts. • Cookers and Showers use either 6mm or 10mm coper wire, dependent on the ‘rating of the appliance’, and are fused 32Amp or 40Amp as appropriate. A Ring Main is one continues cable that runs either around the ground floor or upper floor and returns back to the fuse box (creating a loop); and because it’s an AC current (being a closed loop) the current runs in both directions, so you can safely double the load on the circuit, and add as many socket to the circuit as you wish. The other difference is that all the sockets are three pin (with the longest pin on the plug being the earth). The plugs are designed in such a way that the live and neutral pins on an electrical plug only become live once the plug is ‘fully’ inserted into the socket. Nothing useful to add, but I'd like to thank you both, Nathanville and Wilderness, for a highly informative insight into the renewable energy situations in the US and in my own Britain, too. I wish all forum threads were conducted in such an intelligent and civilised manner. I've learned a lot from you both - Thanks again. Should have joined in. I've long been a proponent of green power, as long as it did not create undue hardship on the people. Electric cars are an example of this; while very useful in Britain they are almost useless outside large cities here simply because of the long distances traveled. Another is solar power; in much of the US it is considerably more costly than what is being produced now and thus does create a hardship on people forced to fund it. Electricity is my primary thrust, though there are probably more homes in the US heated with fossil fuels (gas, propane, oil, even coal) as my home(s) have all been total electric, with no other source of energy. I've spent considerable money and effort to make my lifestyle both comfortable and as green as possible, to the point that for the last 20 years my energy bill has fallen in spite of rising costs and the addition, now, of a plug in hybrid car that uses virtually no gasoline as long as I stay in the area (my last tank of 8 gallons of gas bought me some 3400 miles of travel). So I'm always open to options and willing to listen to anything that comes along. Except the inevitable "free energy" scams - those continue to flood the country. The huge difference in size between the two countries is something I hadn't considered before. I'm wondering, though, as Nathanville is suggesting, whether fully-electric cars will become feasible for such long distances in the not too distant future, given the rate of technological progress seen so far. Hopefully, they will. I suppose Australia is a similar case to the US - I wonder what their approach is. Hi chasmac, this summer I’ve talked to my Australian cousins about ‘Renewable Energy’ during a family Skype linkup; but I didn’t think of talking to them about electric cars. It’s a subject which I will raise with them when we have our next family Skype linkup over Christmas; in the meantime I will email them about it. What I’ve learnt from my cousins about fossil fuels and Renewable Energy in Australia is that it’s a little bit like America in some respects and Europe in other ways e.g. although the Australia Government is committed to reducing its ‘carbon footprint’ and the ‘State Governments’ are very committed to it, the Federal Government is less keen and are more interested in clinging onto the use of coal for as long as possible. More like America, Australia has ‘State Power Grids’ rather than a National Grid, and unlike Europe e.g. the ‘European Energy Union’ where the different European countries share Energy to smooth out the surpluses and shortages in supply, there is little cohesion between the State Power Grids in Australia. However, one of the Australian States, to fulfil its continued commitment to Renewable Energy, is currently being innovative by installing the ‘world’s largest’ battery to their Grid System to add resilience to it. For their part, my Australian cousins (and their neighbour) have now installed solar panels on their roofs, and are very pleased with the system. They are now looking at the prospect of having a Powerwall battery installed once they can afford it. Their solar panels generate 5Kwh in the summer and 3kwh in the winter months, so they are now self-sufficient during the day and the surplus they sale to the grid (especially during the summer) more than pays for their evening use of electricity. 5Kw makes them self sufficient? My heat pump to heat/cool the house runs on 120 amps of 240V power, or 28 Kw max usage! Even my car charger draws 10 Kw - adding in cooking and hot water production will raise other usage than heating to 20 Kw. Do they heat with fossil fuels or some other method than electricity? I think it might be miscommunication wilderness e.g. it's 5Kw per hour; whereas I think you might be referring to total daily usage not hourly usage? For clarification solar panels at 5Kwh, on a sunny day, over 12 hours, will collect a total of 5 x 12Kw = 60Kw. In the last 12 months I've used a total of 8,396kw, which averages to 23Kw per day, which equals an average of less than 1kwh. Umm... Kw is an instantaneous measurement of the wattage being used at that moment. KwH is a measurement of how much power was used for one hour, averaged over time. 5 Kw for 2 hours is thus 10 KwH. My last month's bill shows usage of 995 KwH for the month: if a month has 720 hours (30 days) then my average draw was 1.382 Kw for the entire 720 hours. I'd have to figure my year's total, but daily usages, averaged over a month, vary from 25 Kwh/day to 131 KwH/day. The average for a year must be around 50-60 KwH per day. Of course, that's the entire energy bill for the home, including pumping my own water from a well. A year's worth of energy will cost me $1932. And yes, my heat pump can draw up to 28 Kw; should it do that for the entire month, day and night, I'd have to sell my home to pay the bill! Hi wilderness, yes you are using the correct terminology; I may be confusing the issue by using Kwh when I should be saying Kw. For clarity (hopefully); back in 2015 1 solar panel on the roof, at maximum efficiency e.g. during the summer produced 265 watts of electricity per panel; so with 20 solar panels the total production would be = 265 x 20 = 5,300 watts (5.3Kw). Therefore in the summer, on a bright sunny day 20 panels would produce in 12 hours up to 63.6Kwh. Since 2015 solar panels have become more sensitive to daylight e.g. more efficient at producing electricity when it’s cloudy and, the latest solar panels now produce a maximum of over 340 watts per panel, so only 16 panels are now needed to produce the maximum of 5.5Kw. Obviously in the winter months, when it’s less sunny and daylight hours are much shorter, the total daily production of electricity from solar panels is greatly reduced; and the home owner is far more dependent on the Grid. That's the idea. When the solar people checked out my home they used records which (supposedly) indicated how many hours of good sunlight were available, on the average, to compute the yearly output of the panels. Not sure they included the days when the panels were covered with snow, though. You must have large panels or something, though - I haven't seen any 4'X8' panels will produce anything like 350 watts even on perfect days with perfect alignment and certainly the ones they were trying to sell me wouldn't. Hi wilderness, the main thing is that you have looked into it, got a quote and made an ‘informed’ decision; and at this time it’s not a viable option for you, which is fine (under your circumstances I would probably make the same decision). It’s like as you explained with electric cars, they’re not a viable option for most Americans at this time, whereas hybrids (which is a good compromise) is practical. If the company who gave you the ‘quote’ is reputable then they should have taken local weather conditions into account; including winter snow. When I ask a company for a ‘quote’ (as we did for our double glazing last year), I always research them thoroughly on the Internet beforehand; which I’m sure you do as well. I don’t know what the climate is like where you live, but if it’s anything like Scotland, where they don’t get much daylight in the winter and are prone to lots of snow, then it’s not the most ideal location for solar panels. If I lived in Scotland I would be more hesitant in thinking about getting solar panels e.g. they only get 7 hours of daylight in December, and are prone to some heavy snow in the winter; while in Bristol in southern England we get 8 hours of daylight in December and although we used to get snow annually, we’ve had hardly any snow since the 1980’s due to climate change. • The panel with the highest peak output (of 380 watts) is the STP380Ts-DA by SunTech, which measures about 8 feet by 7 feet. • While the panel with the highest output per square foot is the ‘315 Solar Panel’ by ‘SunPower’ that measures about 5 feet by 3 feet, with a maximum output of 315 watts per panel. Previously mentioned, SHELL (an Oil Company) in the UK are rolling out charging points across the country for electric cars; looking at the list of solar panel manufactures in the above link, I've just noticed that BP (British Petroleum) is another Oil Company in the UK embracing the 'Renewable Energy' revolution. Yeah, I didn't check up on the solar company; with the numbers that came up there wasn't a chance of me buying, so it didn't seem necessary. But for sure before spending thousands of dollars both the company AND their figures would be checked! The valley I live in very often has inversions, sometimes that last for weeks and weeks. It's daylight, but you can't see the sun, meaning that while panels will product something it will be just a shadow of their rated output. And last year I had snow on the roof for probably 60 days - 60 days that any sun can't reach the panels. I tend to have more of that than surrounding homes as I put in extra attic insulation and the snow just doesn't melt off. The large panel you mention is considerably larger than is common here. But the efficient one does better than anything I've heard of - I'd love to have one on my RV, along with a good sized inverter. I know what you mean; the original double glazing on our house was from when they were first rolled out across the UK in the 1980s, and not very efficient compared to today’s doubling glazing units. I didn’t bother looking into having them replaced for years because at least we had double glazing that kept the warmth in; and the big ‘national’ double glazing companies’ just charge too much; more than I could afford. 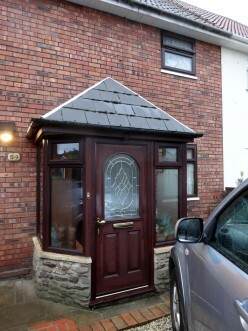 Then a couple of years ago a friend of mine had his windows re-done with a local company that doesn’t over charge e.g. just an itemised bill for the cost of labour and materials. So I started to look around for the local companies online and checked them out; and finally got a free quote from several. So after that, we ended up having our whole house re-double glazed (including new front doors) by a local company last year for less than half of what it would have cost if we had it done by a national company; and the difference is certainly noticeable e.g. the house is now a lot warmer in the mornings before the heating switches on. Then after the installation was compete, and just before Christmas last year, the Double Glazing Company personally delivered a bottle of wine to us as a ‘thank you’ for our custom; which I thought was a really nice touch. Wow, you certainly don’t have the best of the weather (or sun), it must add a fair bit to your heating bills during the winter; and the lack of direct sunlight must also make it more challenging for gardeners in the summer. LOL Lack of sun in the summer isn't a problem! Week after week without a cloud in the sky - compared to us the entire UK might as well be a rain forest, albeit a cold one. We probably don't see more than 2 or 3 rainy days all summer. But those winter inversions, trapping any pollution and cold, damp temperatures down by the ground, are downright depressing. Mankind isn't designed to go without sun for weeks at a time. My electric usage averaged 131.4 KWH per day last Jan, and 25.8 in July. And we ran the AC in July! We have now replaced all of our windows - when the house was built in 1972 double glazing was unheard of and our sun room had 12 aluminum windows that actually bowed in a windstorm enough to blow the curtains around. Removed 8 of them and replaced the other 4 plus all the other windows in the house. And we used to have radiant ceiling heat (heat wires buried in the plaster of the ceiling) that was nice, even and warm, but very, very expensive to operate. Having worked in the window and door trades , I can tell you that that is where most energy wastes away through . Modern insulated doors , all your windows and ceiling insulation upgrades are a must . Thanks for clarification e.g. it’s the winter that’s the issue where you live. In comparison to your electricity usage: My electricity usage is an average of 23 Kwh per day, and is fairly consistent all year round (albeit a little higher in the winter because we use more lighting), but we don’t have Air Conditioning, or use electricity for heating e.g. Central Heating systems in British Homes uses Gas. Thanks for the info ahorseback, I fully agree. When we bought our house we fully insulated the loft (roof space), and about seven years ago we had our cavity walls insulated for ‘free’ as part of the Government’s national scheme to make British Homes more energy efficient; which made some difference to our heating bills. But certainly, having had the most up-to-date double glazing windows and the modern insulated doors installed last year has made a noticeable difference; and has cut our heating bills quite significantly. I don't know - we seem stuck on the battery problem. While we may well find better batteries, and in the not too distant future, the problems of infrastructure, additional power generation and most importantly charging time is a thorny problem to fix. We have to remember that if we make a battery good for 500 miles, the recharge time of several hours isn't going to be acceptable. Thanks chasmac, yes it’s refreshing to have a forum where people debate rather than argue; as a result I’ve learnt far more about America from wilderness than I would otherwise have done, and with it remaining civilised I’ve gained a lot more respect and understanding for Americans. To be honest I think most Americans are aware of the role we play on our environment, even those saying they think it's a hoax. The real problem is that there's no quick fix. What can a lower-middle class individual really do to fix this, they don't have the power to drive immense changes, our government does. But if the government refuses to do anything, then what exactly are we supposed to do (vote better maybe). As far as renewable energy goes or EV's, the technology is still very limited and small scale. Luckily it has been growing exponentially and eventually there will be a tipping point that reaches mass adoption. Unfortunately our technological tipping point may coincide with the climates tipping point in which they'll be a point of no return. Once that happens and our year to year climate volatility increases ten-fold will skeptics realize the immediate danger. As of now climate change is still relatively slow for most people to notice and a lot of people confuse weather variability for climate change (example, unusual cold/snow when scientists say we should be warming). Heck even our president made that very same mistake and when people look towards world leaders for guidance, then it doesn't help that he's against climate change (mostly for financial/political reasons). Thanks for your input Chriswillman90, I think you’ve highlighted the problem in America in that if the Government refuses to do anything about it then it makes it difficult for individuals to have any real impact. I guess that’s the difference between America and most of the rest of the world. The German Government is closing down all its nuclear power stations in preference for Renewable Energy and likewise The British Government has closed all its coal power stations except one, and that’s due to close in 2025. • The installation of solar panels on people’s roofs in Germany (which is growing annually) currently accounts for 6% of their total electricity production; so their individuals are having an impact. • Likewise, the total number of solar panels installed on people’s roofs in the UK has doubled in the last year (so now the UK matches the achievements of Germany), with indications (if current trends continue) that one third of UK homes will have solar panels by 2020; producing 40% of the nation’s total electricity needs during the summer (obviously dropping off significantly during the winter). Yes, the technology is still new, but it is growing exponentially, and in Europe the tipping point was reached in 2015 when for the first time Renewable Energy became cheaper than fossil fuels. Yes, I get the impression that America hasn’t been greatly affected by climate change yet, while in contrast Europe has; and that (without a doubt) has been the driving force behind Europe’s commitment to the Renewable Energy Revolution. Yet again, this year has been the hottest year on record in the UK; which seems to be a familiar pattern most years in the UK these days. For as long as I can remember Bristol (where I live) always used to have snow every year (between January and March), sometimes quite heavy; but since the late 1980s we’ve had hardly any snow; in fact, we haven’t had any snow in Bristol since 2009. As a keen gardener (I grow all our own vegetables except potatoes) the summer growing season has been slowly increasing over the years; just 20 years ago it was from mid-April to mid-September, whereas now it’s from early March to late October (an additional 10 weeks growing season). In the past I would put the heating on from mid-September, in more recent years it’s been closer to mid-October, and this year I didn’t put the heating on for the first time until this week (early November); and even now I’ve got it set far lower than I would normally have it for this time of year. So yes, Europeans are acutely aware of climate change. The EPA conducted Nazi-style experiments on hundreds of unhealthy and uninformed humans. They submitted false findings from their experiments. What a waste of time and money. The EPA was corrupt and down right deceptive....so they could peddle a false narrative and create regulations. I don't know that anyone has been held accountable. I do know there has been a change in guard. Reflecting on 50 years of geoengineering research"
Having genned-up on geoengineering I then read the article thoroughly, and in doing so found a number of dubious, misleading and inaccurate statements. Therefore I first looked for credibility for the website (The Millennium Report) and found none e.g. there isn’t the usual ‘About Us’ menu link, or any identification of the people who run the website, key factors which you will always find on any credible website; and neither could I find any references to the website from any credible source. As regard the article itself; as source references to the article, it makes numerous ‘source references’ to other dubious websites e.g. ‘Chemtrailsmuststop.com’ and ‘cosmicconvergence.org’, but no links to any credible ‘source references’ except for an indirect link via ‘Chemtrailsmuststop.com’ to the NCBI (National Center for Biotechnology Information), and even then the related article published on ‘Chemtrailsmuststop.com’ makes false statements in the ‘Headline’ and ‘Heading’ to misdirect the reader into thinking Geoengineering is conducted on a big scale as confirmed by the NCBI Report. Whereas, not only isn’t there any credible evidence that Geoengineering is actually carried out by the USA but also the NCBI Report doesn’t support this claim. The NCBI Report is nothing more than a ‘Research Paper’ on the subject of Geoengineering, the Report concludes that “further research is required” to determine whether it would be safe to deploy Geoengineering; essentially the opposite to what the ‘Chemtrailsmuststop.com’ article claims the NCBI Report says. Also, where some people are getting confused is that Geoengineering Research isn’t carried out in the real world; but is carried out on ‘computer models’ to simulate the possible implications of different technologies. That would seem a resounding effort to delegitimize the information put forth, and I commend you for the effort. And may I state further I am not defending that information... rather lets review some of the sources you are using to counter it. Wikipedia was referenced several times, we could review Jimmy Donal Wales, founder and CEO, Wales also founded the for-profit web-hosting company Wikia, and has advised governments and universities. Wales is an outspoken atheist and an adherent of Objectivism, with a Elitist bias, objectivism privileges individualism, capitalism and reason. He identifies as a libertarian though he is not a supporter of the Libertarian Party. Wikipedia is what it is, source of information that can no more or less be depended upon to be 100% factual and honest than any other site we visit. It is run by people, and people have biases. I guess its about who and what you decide to choose, the mega-billion dollar conglomeration that owns Time magazine, which is more propaganda than fact. Or the schmuck scientist or ex-pilot that decides to put his livelihood and life at risk to get the information out, or someone who collects such information and creates a website to it. That link at the end UK:24 about the contrails is rather... uhmm... unrelated to the matter. Have you ever spent time at an airport? Have you ever seen a sky filled with Chemtrails because of it? No, of course not, none of us have, because they don't last long enough for commercial airline planes to make them. ... that debunks that idea, doesn't it? Its all good, I don't have any of the answers to this at all, I was just putting it out there for consideration. Thanks ken for debating this constructively. I am curious, critical, sceptical and adherently objective by nature. So it’s no surprise that I also have an analytical and scientific mind; qualities which were honed during the course work at college and which became vital in my work during the last 20 years of my career. I am also aware of my biases e.g. humanitarianism (so I deplore violence, blood sports and the death penalty etc. ), a vegetarian, an atheist, and a Socialist; albeit I tend towards pragmatism (an element of realism) rather than being ‘subjective’ and too passionate on social and political issues. Therefore when I’m looking for (or evaluating) information I don’t take it at ‘face value’, I need to satisfy myself that the information presented is reliable and trustworthy. Having a scientific mind and being aware of my biases, I strive to be as impartial and as open minded as possible when assessing the information. To this end (as well as the obvious ‘Fact Checker’ procedures) one of the other key aspects I deploy (when necessary) in determining the validity of data is its falsifiability. In science, no statement, hypotheses or theory can be taken seriously by the ‘scientific community’ if it doesn’t include ‘falsifiable predictions with consistent accuracy across a broad area of scientific inquiry’ (an inherent possibility that it can be proven false). In practice, it means that when a ‘Research Paper’ is published in New Scientist (or some other Science Journal) the scientific community will be critical rather than acceptance of the Report e.g. if the Report is flawed the scientific community will most likely find the flaws, and if they don’t then the Report will generally be accepted as valid work. Unfortunately, all too often the news media, innocent websites in their ignorance of how the scientific community works, and unscrupulous website (when it suits their purpose) will publish extracts from these ‘Research Papers’ when they are still in their early phases of debate within the scientific community as ‘fact’; even though the findings in the Research Document hasn’t yet been fully scrutinised and either accepted or rejected by the scientific community. Getting back to your first point; I didn’t set out to ‘delegitimize’, but I do know enough about the subject scientifically to spot the deliberate deception in the article within the first 20 seconds (Fake News). Normally, I wouldn’t have bothered scrutinising the website article any further; as I’ve got better things to do with my time. However, I felt that for the benefit of ‘other readers’ I should make an effort to highlight some of the flaws in the article as a demonstration of ‘readers beware’ e.g. if you want to be sure the information you read has credibility (rather than just be spoon fed false information and lap it up) then it pays to make some ‘fact checks’ of your own and make your own assessment of the credibility of the information being supplied. As regards websites which can be trusted for its information e.g. Wikipedia. Wikipedia is ‘Objective’, ‘Moderators’ don’t permit ‘subjective’ writing in Wikipedia articles, and any claims made in Wikipedia has to be well sourced from ‘reputable’ sources e.g. in February of this year Wikipedia editors voted to ban the Daily Mail (and Mail Online) as a ‘reference source’ in Wikipedia articles because the Daily Mail and Mail Online are renowned for ‘Fake News’. I agree with you, no website can be 100% ‘factual and honest’, so you should always cross check your information with other reliable sources. There have been occasions when I have found errors and omission on Wikipedia (in areas where I am knowledgeable), but not often; on the whole Wikipedia is a remarkably reliable source of information. When deciding what websites, articles, and other information sources to trust, I’m not interested in what person/people or organisation controls that information provided they report it openly, honestly and trustworthily, and the information they provide is properly sourced from reputable sources. A prime example is the ‘National’ British Newspapers. British National Newspapers fall into three broad categories, ‘Quality Press’, Gutter Press’ and ‘Fake News’. The Daily Mail and Mail Online are renowned for publishing ‘Fake News’, so although they do also publish genuine news items you can’t trust what they write because it’s difficult to distinguish between genuine and fake news in their publications. Both the Mirror (which supports the Labour Party) and the Sun (which supports the Conservative Party) are ‘Gutter Press’, who writes for sensationalism rather than being factual. However, the Telegraph, Guardian and Independent are all ‘Quality Press’ of different political persuasion. The Telegraph is often referred to as the ‘ToryGraph’ by socialists because its politically biased towards the Conservatives (Republicans). The Guardian is aimed at the ‘Middle Class’ Labour supporters (Socialism), while the Independent claims to be what its title is e.g. Independent, although in practice it’s aligned more with centralist political party in the UK e.g. the Liberal Democrats (Democrats). When I’m browsing the British Press I’ll not waste my time with the Daily Mail (Mail Online) because they publish too many fake stories, and I’ll not bother with the Sun or Mirror because the facts get obscured by sensationalism. However I do read the Telegraph, as much as I read the Guardian and Independent, in spite of the fact that I am a Socialist and the Telegraph is politically biased towards the Conservatives. In spite of its political bias (which I don’t agree with) I do have respect for the Telegraph for ‘Quality’ reporting e.g. factually correct, and therefore I do find some of the information it publishes as being useful. As regards the UK24 video; no I have never spent any time as an airport (or even been to an airport); in fact I’ve never flown in a commercial passenger plane in the whole of my life. However, although I don’t live under an air path, and therefore almost never see low flying planes coming into land, Bristol (where I live) is situated below ‘International’ air routes going east and west between London and America, and south and north between international airports in northern Britain and Europe. So on a clear day it’s possible to see planes crisscrossing the sky above Bristol, and when the weather conditions and climate are just right it’s quite normal seeing their contrails as they do so; the contrails above Bristol often linger for anything up to 30 minutes or more, so it doesn’t take long to see the crisscross effect that ‘conspiracy theorist’ so often cite as evidence of Chemtrails. Thanks for the links. The article in the first link is well written; I have no criticism or comments to make about it. Although, I do take ‘issue’ with the 2nd link; Metabunk.org comment is “Outrageously fake chemtrails video.” , stating that “Harold Saive is promoting this video on various forums”.. That is just their opinion which in itself is not sufficient to debunk a video. Having watched this other video by Harold Saive, I’m of the opinion that he’s not the sort of person who can be trusted to publish videos to YouTube that can be taken at face value as being ‘trustworthy’. First I want to commend you, we have debated issues in the past, and it is clear you are a highly intelligent individual that takes pains normally to research your position on a given opinion. However as you noted, you have not spent any time at an airport or flown in a commercial airline... but you see contrails in the air at times. And so have I, I understand the difference between a couple contrails that can last a half hour in the sky, and a sky crisscrossed in the middle of some nowhereville part of the world where air traffic never is heavy enough to create more than one contrail. I also have watched a couple government board hearings (don't recall what anymore) where scientist after scientist in various fields of chemistry, environmental science, etc. presented their findings, toxic levels of certain chemicals found after heavy chemtrails were seen over a given area. That aside I have been to many airports, I have traveled substantial amount, and I have literally sat on runways for hours as significant amounts of air traffic came and went... the sky for miles around remain clear, and there are no lasting contrails. It is my belief, that no amount of research, no amount of fact checking, can make up for what I call 'Instinctual intelligence' based on well grounded experience. Let me explain that a bit, almost everything we become good at is built upon a foundation, I did not wake up one day and decide I wanted to be good at map reading and land navigation for instance, but over time, after years of putting it to practice in ways few people get a chance to, I became an expert at it... to this day, I can navigate myself around anywhere or anything so long as I have an accurate map. I can do this by air, vehicle, or foot. It is an 'instinctual intelligence' based upon a wealth of experience. So when my GPS tells me to go left, and I know my destination lies to the right, I know the GPS is wrong. Most anyone else would of course believe the GPS, because, well, GPS is never wrong... except when the satellites cut out, or the address was typed in wrong, or whatever might be causing it to be wrong. A better explanation would be when a group of architects, engineers, explosives experts, chemists, etc. come together and say in no uncertain terms, and with hundreds of years experience between them, that the twin towers and building seven could never have fallen down on their own footprints without it being a demolition job, and only one specific type of explosive could have blown through that type of steel, and evidence of that explosive being used was all over the place... you have a choice, you can believe the efforts and reports of those experts that have nothing to gain by bringing this information forth... or you can believe the 'official' story. As man of science and who likes to research his facts, you have a choice, you can dig to find what seems most logical and reasonable... or you can dig to find what is most 'reputable' and well supported by the 'establishment' and 'official' reports. The biggest impediment you have however, in the matter of chemtrails is the lack of experience being at airports, flying on planes, etc. because you are solely relying on other's information without the 'instinctual intelligence' and experience to rely on, therefore you don't really know what the difference would be between an contrail and a chemtrail, having never experienced them or witnessed them upclose. ...which is not saying you aren't intelligent, but intelligence does not trump experience. You could read all sorts of reports that would tell you fire is not hot, and if you never saw fire, you would have no reason to doubt it. But if you had ever stuck your hand in fire long enough for it to burn, you would know that all those reports were BS, no matter what reputable sources were behind them. BTW - I agree those video links look like contrails, those are NOT the chemtrails I am referring to, chemtrails are often four times that wide, and can literally take up most of the sky for as far as you can see. Ken, for clarity (reference your third paragraph above), the 1st video link I gave of the contrails in Bristol (where I live) wasn’t ‘just a couple of contrails’, as you seem to be suggesting; if you count them carefully it’s a grid of 4x4 squares (16 squares total, with at least another half dozen contrails to the left (as the camera pans around). As regards your statement (in the same paragraph) to ‘a sky crisscrossed in the middle of [nowhere]…where air traffic is never heavy’; I can’t comment as I don’t know enough about the subject, and if that point was to be debated in greater detail I would need to know where this ‘nowhereville’ is so that I could I could independently investigate the level of air traffic (at high altitude) in that general area, or be given reliable details from a source that I can trust. I’m not disputing the comments you make in your 4th paragraph (I have to take what you say on trust). However I can’t be expected to have any personal views on it without hard evidence from a reliable source. As regards your observations in your 5th paragraph, I assume that you are aware that contrails are formed at high altitude and therefore I wouldn’t expect to see much in the way of contrails near airports; where planes are flying at low altitudes to land and take off. Where contrails will be most prominent will be away from the airport, once the planes have reached higher altitudes. For example, Bristol airport is over 12 miles south west of where I live, so I almost never see any low flying aircraft. Whereas, there is typically 7,500 aircraft flying over Britain at high altitudes in every 24 hours; with a lot of the traffic flying over Bristol because we are on some of the main flight paths for planes travelling east/west between America and London, and south/north for planes flying to/from Birmingham, Manchester and other major airports to the north of Bristol as they fly south of us to/from Europe. I assume you are aware that contrails isn’t the exhaust of planes but ‘condensation trails’, composed primarily of water and can be caused by a combination of water vapour in the aircraft engine exhaust (mixing with impurities in the fuel) at the low ambient temperatures that exist at high altitudes; contrails can also be caused by changes in air pressure in the wingtip vortices or over the entire wing, at high altitudes e.g. at low ambient temperatures. How long contrails last e.g. from just a few seconds to hours, is dependent on temperature and humidity. For contrails that last longer (as is quite common over Bristol) they don’t just disappear, they spread out to eventually resemble natural cloud formation (similar to cirrus and altocumulus clouds); this type of contrail is known as ‘Persistent Contrails’. With reference to your 6th paragraph, I agree with you to a point; but it’s not just experience, it’s a combination of many attributes including aptitude, instinct, education (tuition, guidance, mentoring) and experience etc. Also, everyone is different so what may come easy or natural to one person another person has to work hard to acquire the skill (whether it be education or experience). 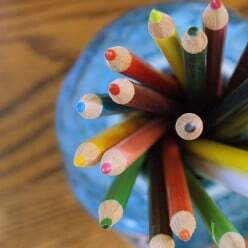 My forte is ‘Technical Drawing’ and ‘ICT’ (Information Communication Technology). My weakest area is language e.g. I’m dyslexic so I struggled to learn English, so much so that I couldn’t pass my English exam at school but as I had all the other qualifications I needed to join the civil service I was given the job on probation on the understanding that I went back to college on day release to get my English ‘O’ level certificate. I edged my bets and studied both English Language and English Literature e.g. I only needed to pass one of the exams to keep my job; but I worked hard that year studying, and fortunately passed both exams. I also studied Human Biology that year just for the fun of it (as the government was paying the course fees), and passed that exam too. Even now (after all these years) due to my dyslexia I can’t fast read an article (like most people do), I have to read it word by word (and sometimes even letter by letter for some words); which makes for slow reading, but on the plus side because I read so slowly and thoroughly it gives me a good retention of data and information e.g. if I have to refer back to something I have a reasonably good idea of what it said and where to find it. I’m far better with numbers, I can number crunch (scan read) vast volumes of figures and compile data, numerical patterns and anomalies etc. from the numeric data in my head. As I said ‘Technical Drawing’ is one of fortes. The first secondary school I went to didn’t teach it, but I moved to a new school (which did teach Technical Drawing) halfway through the academic year. When I moved schools, although I’d never heard of technical drawing before, and I was over four months behind everyone else in the class, I took to it like a duck takes to water e.g. I understood it right from the start; so come the end of the academic year (less than five months later), not only had I long overtook most of the class I was also amongst the top 6 in the class. Therefore, when it came to the final year at school e.g. the year when you spend most of your time revising for the final exams (qualifications) I didn’t bother doing any revision for technical drawing; instead I concentrated all my efforts into revising for other subjects that didn’t come so naturally to me. Nevertheless, even without the final year revision in the subject I passed the technical drawing exam with top marks (Grade A), ‘O’ Level. My other forte is ICT. When Windows 3.1 was first released (and I bought my first computer) as a way of learning how it worked I spent the first week deliberately corrupting the Operating System by pushing it beyond its limits, and then spending the next few hours fixing the problems. Knowing how to repair the corrupted Operating Systems was instinctive e.g. I had no training, I just knew what to do. By the time Windows 95 was released I was already a self-taught expert on computers, so when there was an opening for an IT job in our Department I applied for it, even though (at that time) I didn’t have the required IT qualifications. Even though I was the only applicant that didn’t have the required qualifications I was the only applicant that showed ‘aptitude’ (which appealed to the IT Line Manager). So before a final decision was made I was given a test e.g. I was given an old scanner that didn’t work, and was asked to diagnose the problem, which (using my intuition) I did (in my lunch breaks at work), and within three days had correctly identified the fault; which impressed the IT Line Manager, so I got the job. Moving on, five years later, I moved into a technical engineering job; again without having the qualifications (Prince2 Project Management) but getting the job because of my aptitude and natural instinct for the work. Consequently I was the only Admin Staff doing Technical Work, albeit I later did the Prince2 Course to get the required qualifications for the job. The most fun part of this job (which I was working on just a couple of years before my retirement) was my close (hands on) involvement in ‘Research and Development’ for a new device that piloted and went live just before I retired; and which has not only saved taxpayers money but also helps to save lives. Your 10th paragraph; I think this is where we have different perspectives (which is fine, as everybody is different). From my perspective, choice isn’t a consideration. First and foremost, when researching, the data/information I gather has to reliable e.g. there’s no point in me formulating opinions on flawed data because it’s going to skewer (twist) the results (conclusions). However, you are right in that the information should also be logical and reasonable; but I suspect that our criteria for what is logical and reasonable are different. When reviewing information from what I consider to be a reliable source I do also follow my instincts and intuition, and consider if it seems reasonable and logical; if it isn’t then it maybe that my understanding of the subject is wrong or incomplete, or it may be that the article itself isn’t as reliable as first seemed. However, with respect to logic and reason, I have to be more open minded than I would otherwise be because of my interest in quantum physics; which to the outsider isn’t logical or reasonable, it’s weird. A prime example is the concept of ‘Quantum Computers’; it’s a subject I’ve been following with interest in New Scientist since the 1980s. Regardless to whether you watched and or understood the above video; the video below gives our current state of progress with ‘Commercial Quantum Computers’ e.g. NASA and Google jointly bought the world’s first commercial quantum computer from D-Wave just a couple of years ago. Reference your 3rd paragraph from bottom. I admit I knew little about chemtrails prior to our discussion because it’s a topic I’ve never taken an interest in; so I am on a steep learning curve. However, as I pointed out above, you’re not going to see much if anything in the way of contrails at airports because they only form in the higher atmosphere when the conditions are right. True, I wouldn’t be able to tell the difference between a chemtrail and a contrail, but neither can a lot of people who believe in the chemtrail ‘conspiracy theory’ e.g. of the 90 (approx.) photos given on the cosmic convergence.org website as evidence of chemtrails in the link from ‘themillenniumteport.com’ website (which we discussed further up), even by your definition given in your last paragraph, about 70 of those photos are almost certainly contrails and not chemtrails. Also, referencing your last paragraph, contrails that persist in the upper atmosphere for any length of time do expand to become more like the chemtrails you are describing e.g. ‘Persistent Contrails’, which eventually spread out to create clouds indistinguishable from cirrus and altocumulus clouds. All being said, I knew nothing about ‘geoengineering’ until a couple of days ago when we started discussing the topic; so it is too early for me to formulate any set opinions on the subject. However, from what I have read from sources that I know I can trust I am reasonably confident that certainly the vast majority of scientific research are conducted on computer models and not in the real world. As for the other websites I’ve seen, they’ve all have been riddled with inaccurate and false statements, and given bogus reference sources to other sites that are known to peddle ‘conspiracy theories’ rather than presenting solid reliable evidence. That’s not to say there may be an element of truth in some of the claims, but as with all conspiracy theories, the facts get blown out of all proportion (exaggerated) and twisted, and blended with ‘fake’ information. Therefore, without some solid evidence that I can trust (speaking like a true scientist), I am going to remain critical and sceptical of the claims being made by the conspiracy theorists. I like that website, and State of the Nation, they are accurate. Those fake fact checkers are used to discredit truthers, and Wikipedia isn't a reliable website to reference without doing some in-depth research. Here are some key things to look up if you like! Its a hundreds of pages report admitting it is going on, but than they make jokes about on the nightly news when people report on it. Yeah, they have their fake fact checks to discredit real reporting. 2009 report admitting dimming the skies. This is their cover for this. They aren't trying to combat climate change. There are 50 Patenets for this. That is a Pentagon document. Weather control was certified in 1968, it wasn't declassified till the mid 2000's. Put out by the Federal Gov. and several university. There are UN Treaties on it. BAM! ... that's how they are doing it. They say they are trying to protect us from the sun while we have less life and planets dying. I have watched hearings (on Cspan) where they admit they are using weather modification, but then they deny it to the public. Ben Livingston is the father of weather weapons. Very interesting man to listen to. That is a considerable amount of info, I will look into it further one day when I have the time to work my way through it all. Meantime, I'll keep drinking my delicious lemon-garlic juice and hope it helps. Delicious lemon garlic juice? Cheers! Here is some good news, hopefully. I'll have find out if I can listen in and watch their body language. 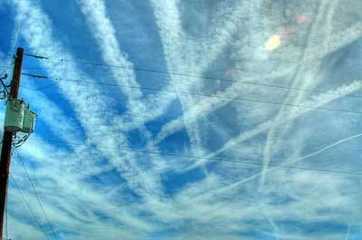 "A Conspiracy No More: US Government Openly Meets to Discuss Future of Chemtrails/ Geoengineering"
Colorfulone, I know you will disbelieve everything I write, so I’ll not waste my time saying too much about the web link you gave. However, the Article ‘A Conspiracy No More: US Government Openly Meets to Discuss Future of Chemtrails/ Geoengineering (published by humansarefree.com) is on the face of it well written and well presented. Nevertheless, one referenced source link I took at random ‘MDPI (Multidisciplinary Digital Publishing Institute) does turn out to be dubious. Having check out MDPI on Wikipedia, it’s referenced to in their article as publishing ‘Controversial articles’ for being ‘pseudo-science’ e.g. ‘fake science’ and for its ‘predatory open access publishing’ practices which by its nature doesn’t facilitate ‘Quality Checking’ of articles, and often leads to ‘journal publications’ of poor quality and even being fraudulent. Also, According to ‘Fake News Watch’, Humansarefree.com is described as a ‘Clickbait website’. ‘Clickbait websites’ are sites that take bits of true stories but insinuate and make up other details to sew fear; most of these websites are conspiratorial in nature and are very unreliable. Electric cars cause more pollution than standard cars. LOL! Energy Department office bans the phrase "climate change"